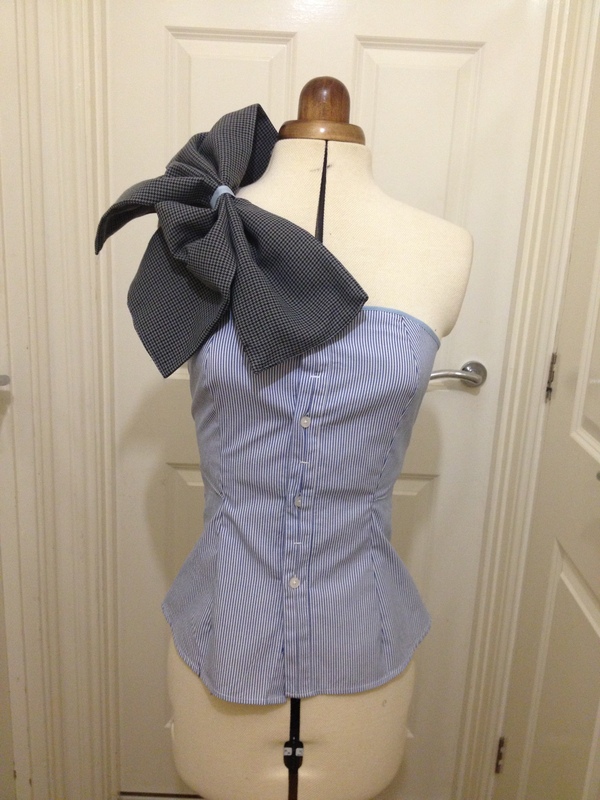 Hope your all as excited about the sewing bee as I am. 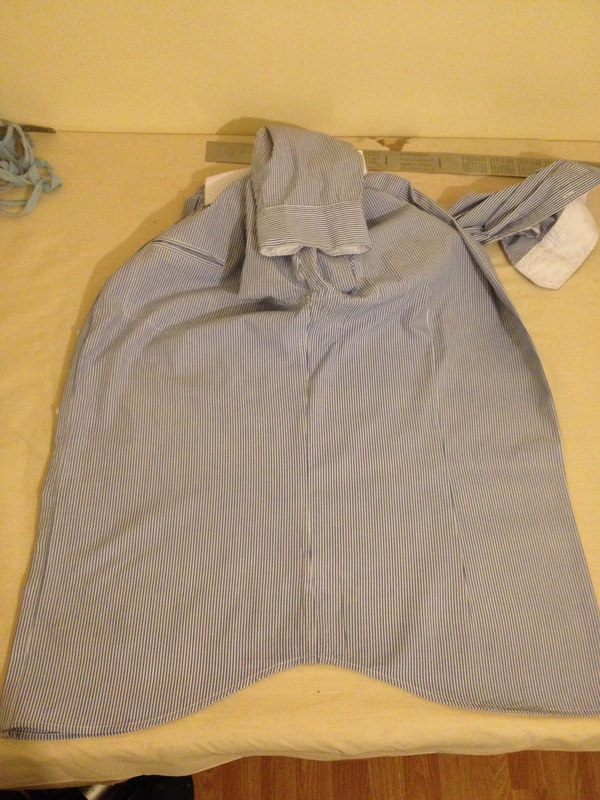 A massive thank you to you all for the kind words and support, it has been great encouragement for me and I just wanna give you all massive hugs. 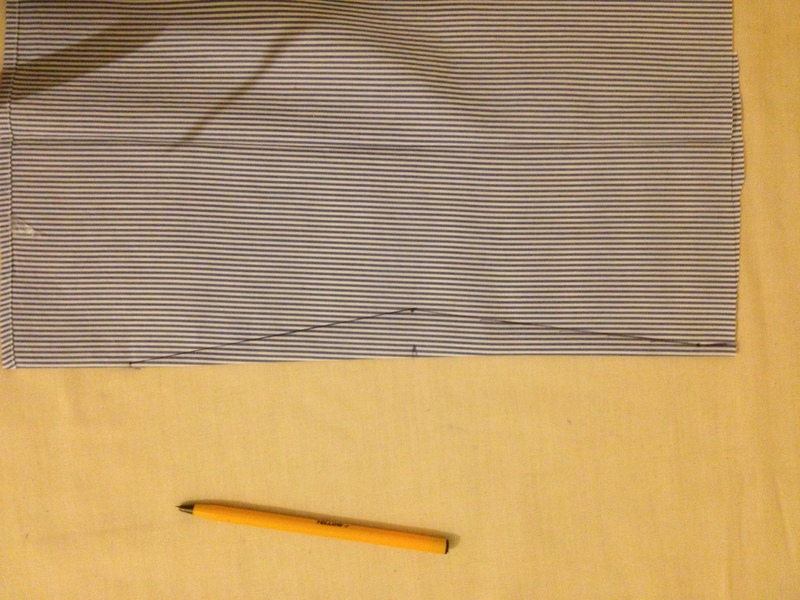 On a downer, it was sad to see simon go this week, he was such a great character and its really encouraging to see a young man interested in sewing; I say that like I’m miles older than him when I’m only a year older, but you know what I mean. 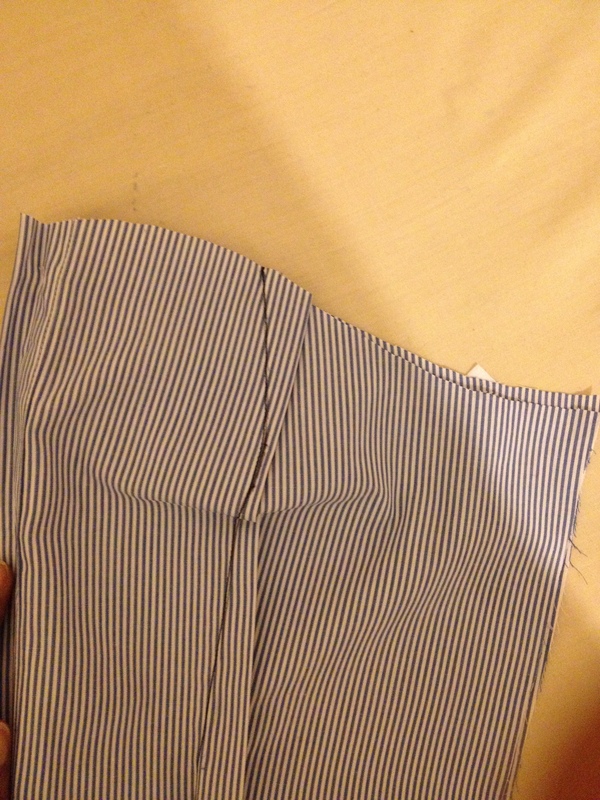 I have been eyeing one of my husband’s old(ish) shirts for a while now so as he isn’t around this has presented me with the perfect opportunity to pinch it, so I have done just that, and check this, it has a stripy pattern (O the joys of re-living sewing bee days). 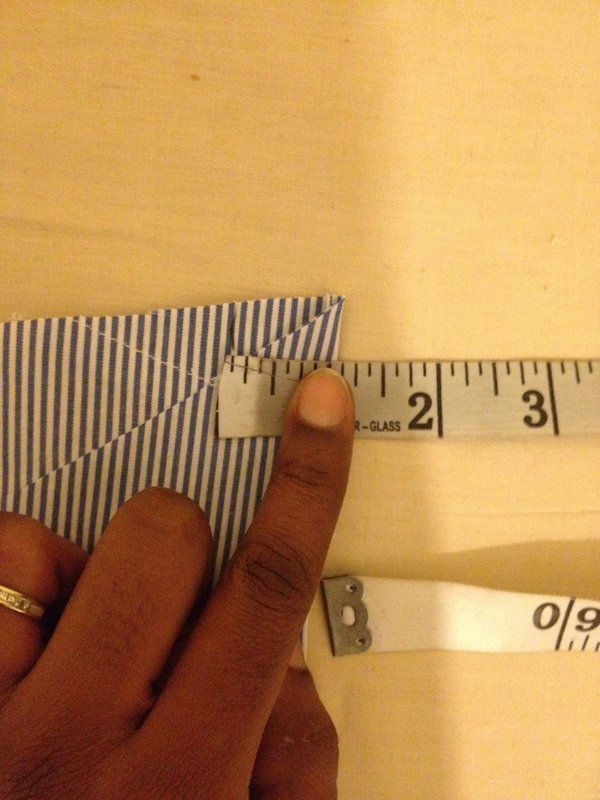 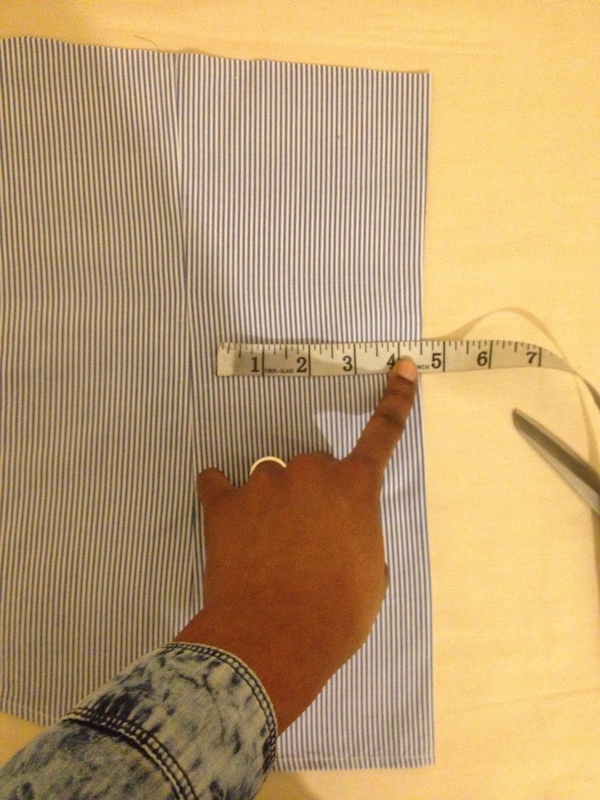 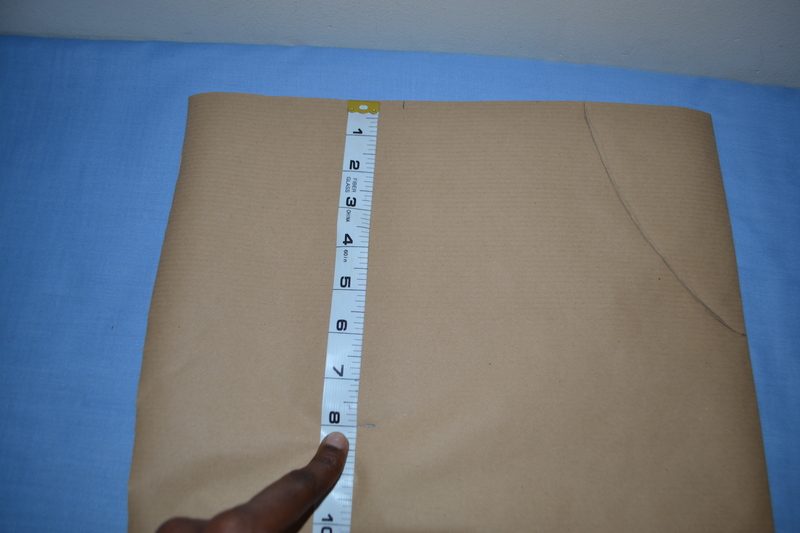 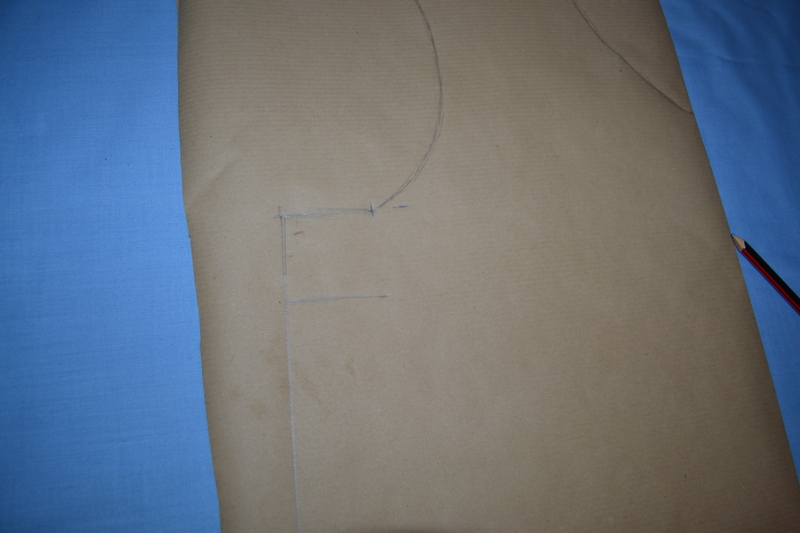 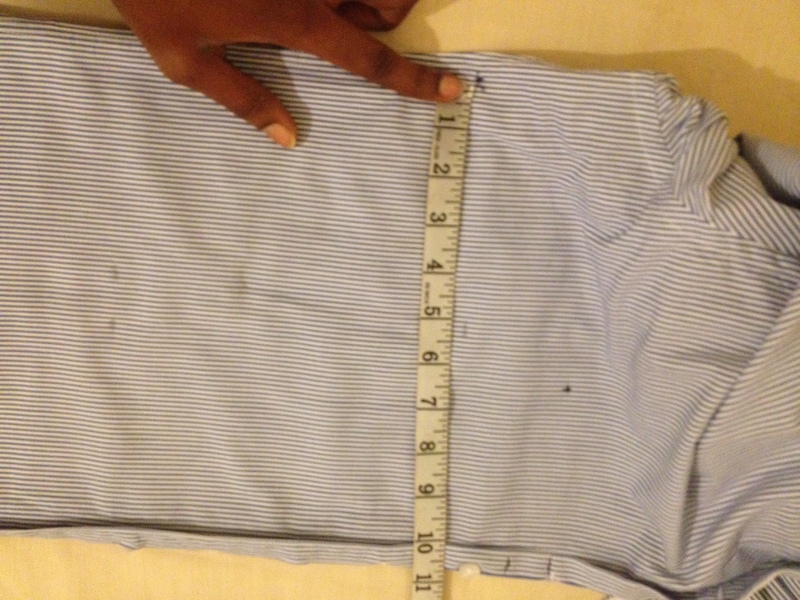 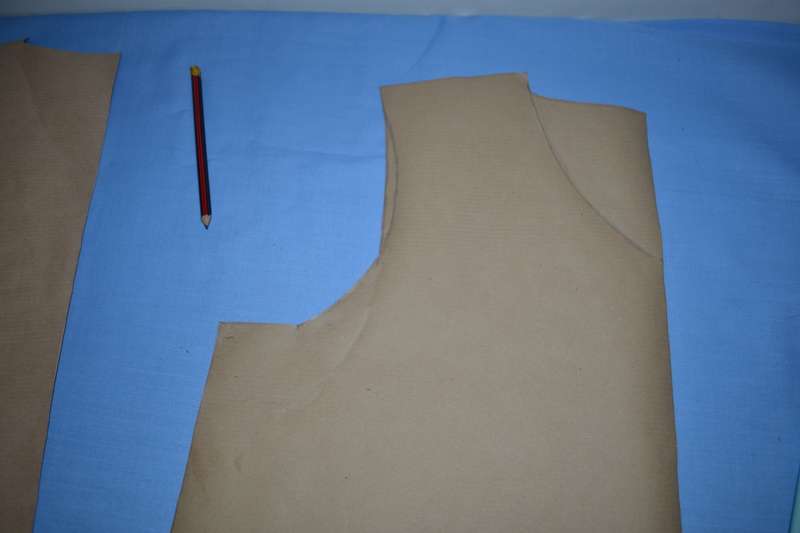 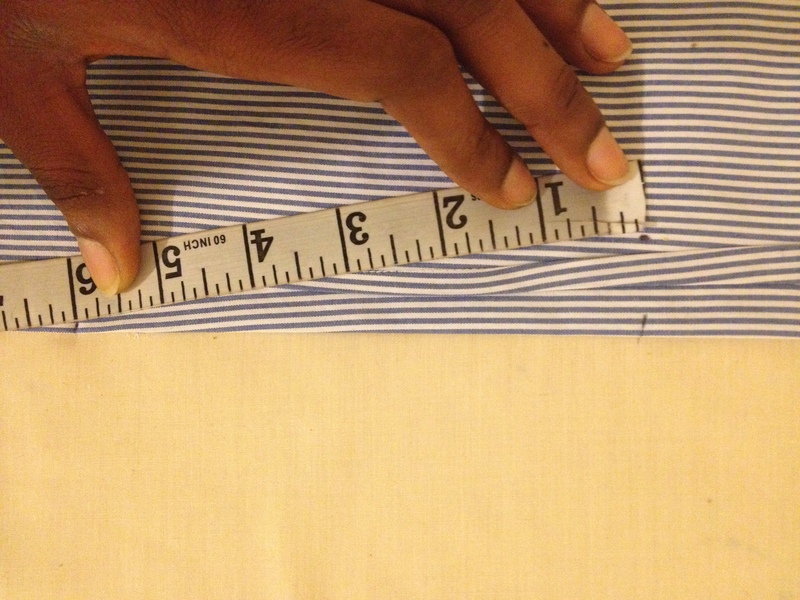 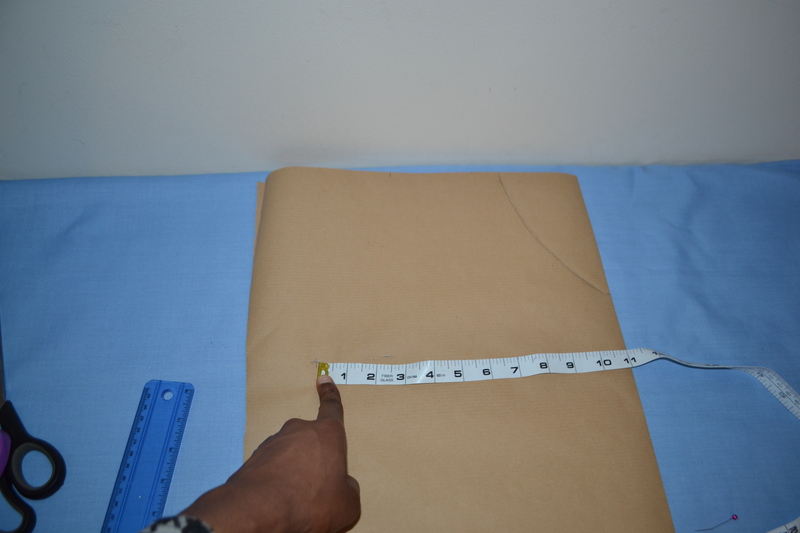 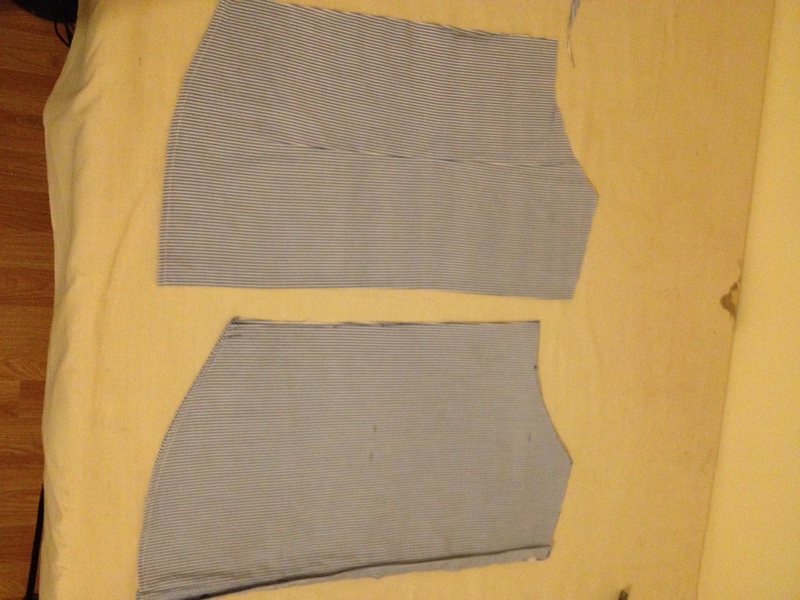 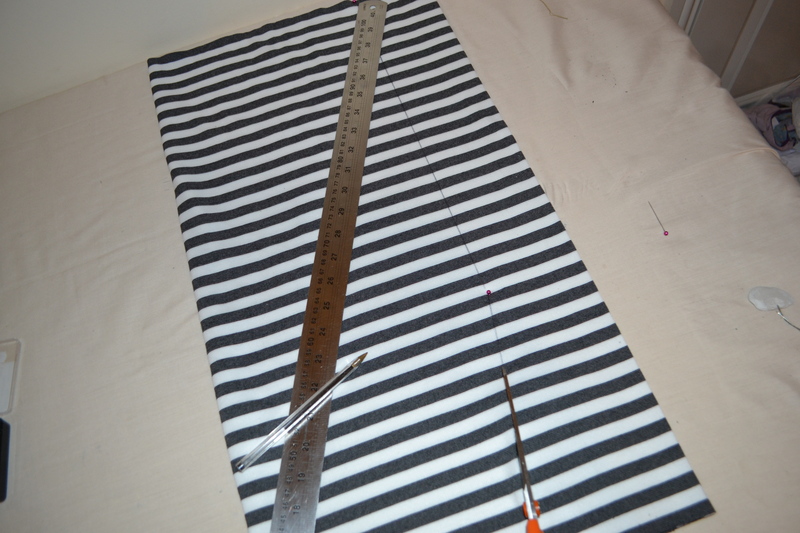 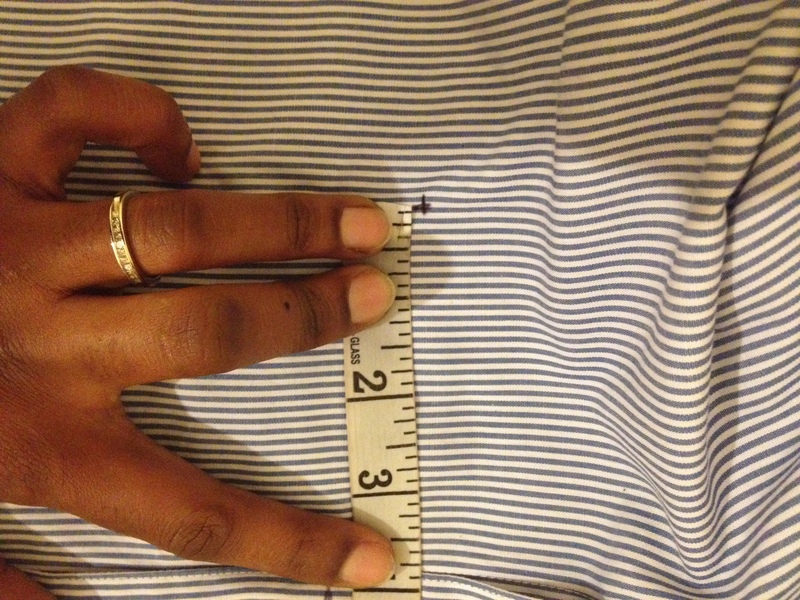 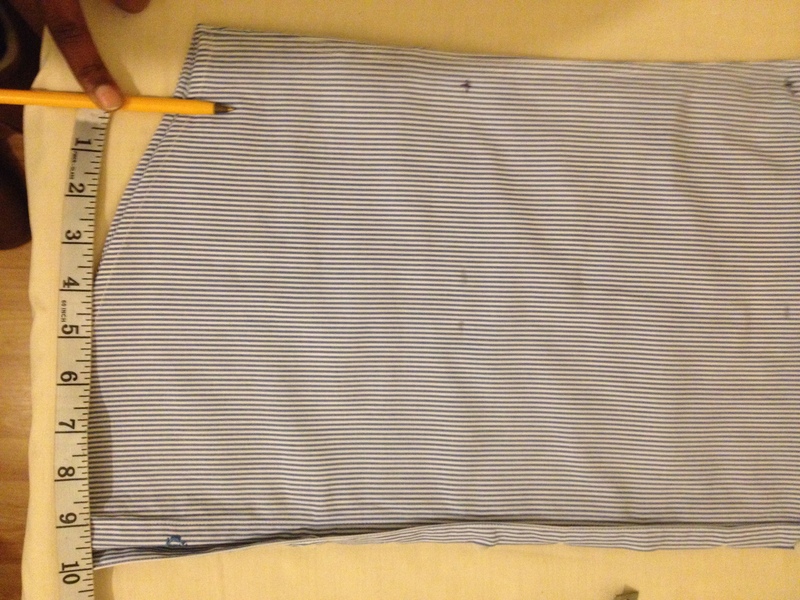 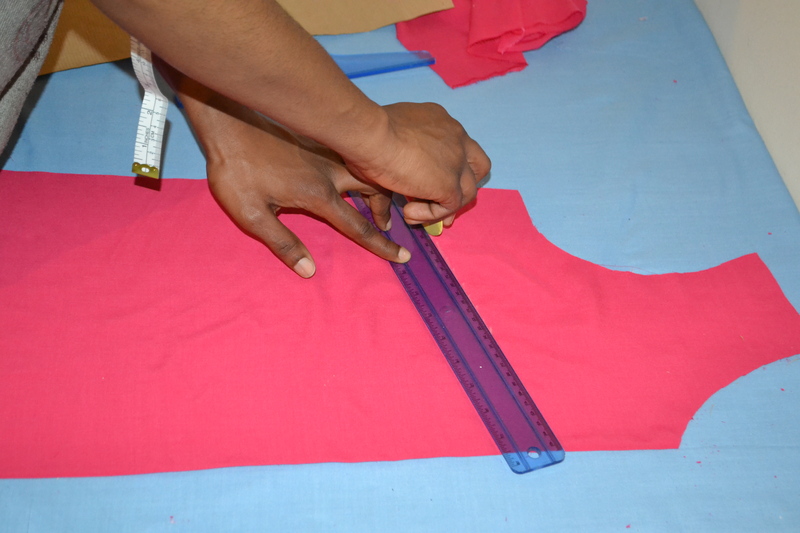 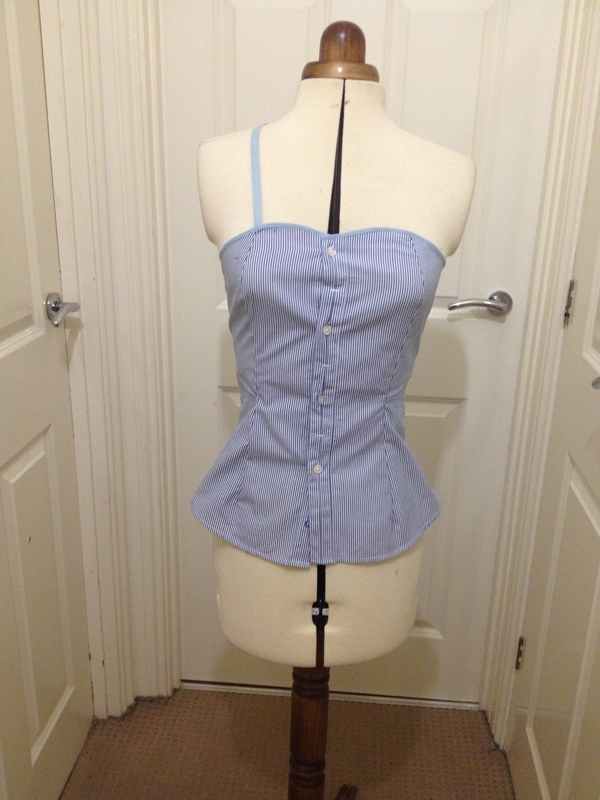 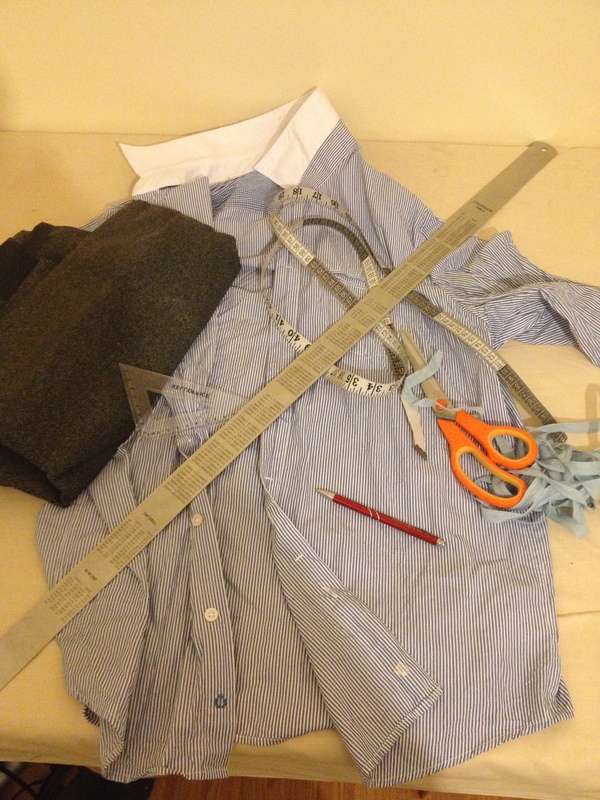 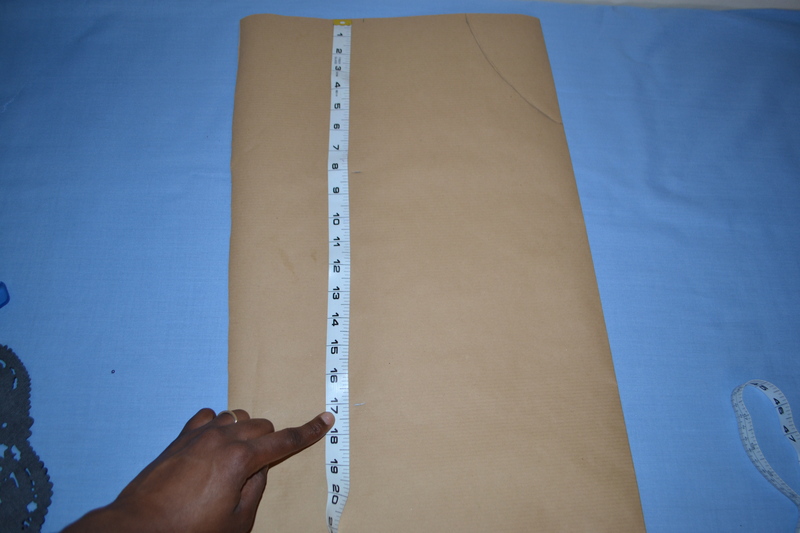 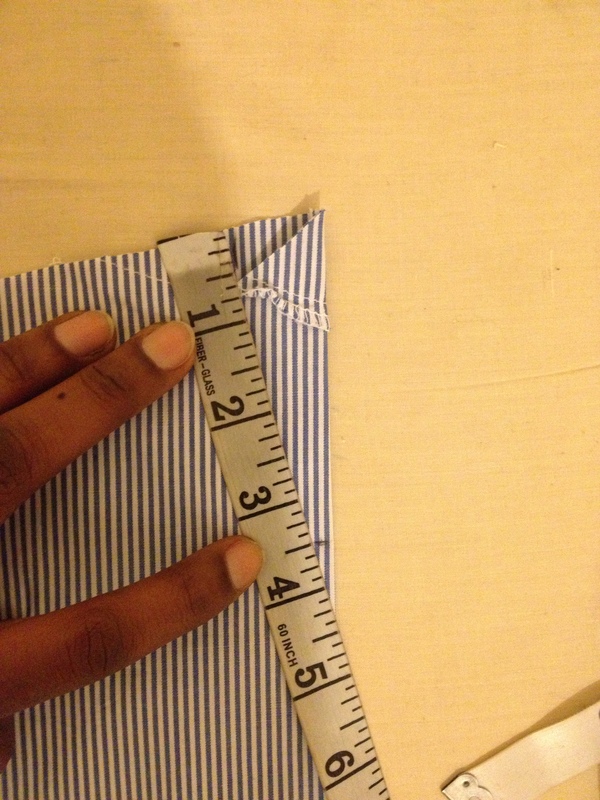 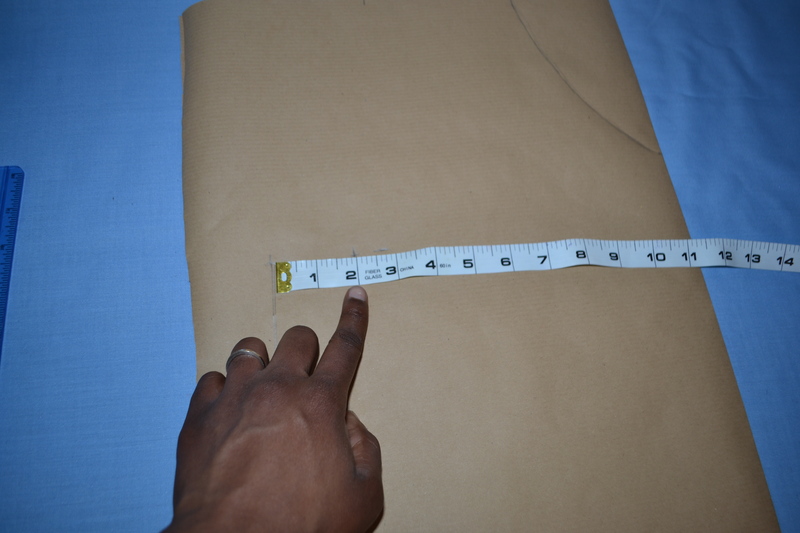 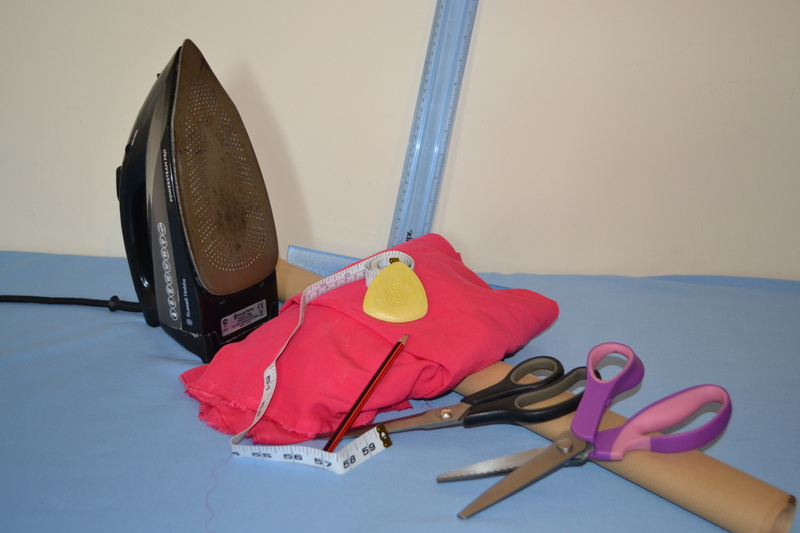 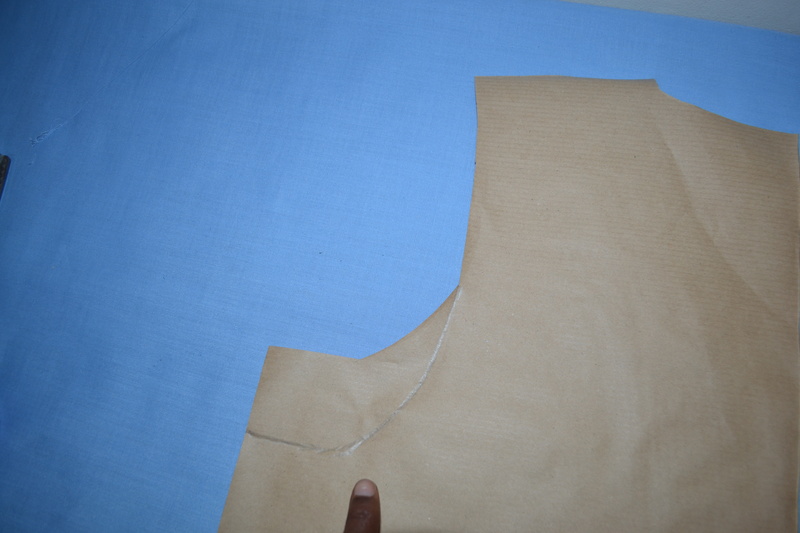 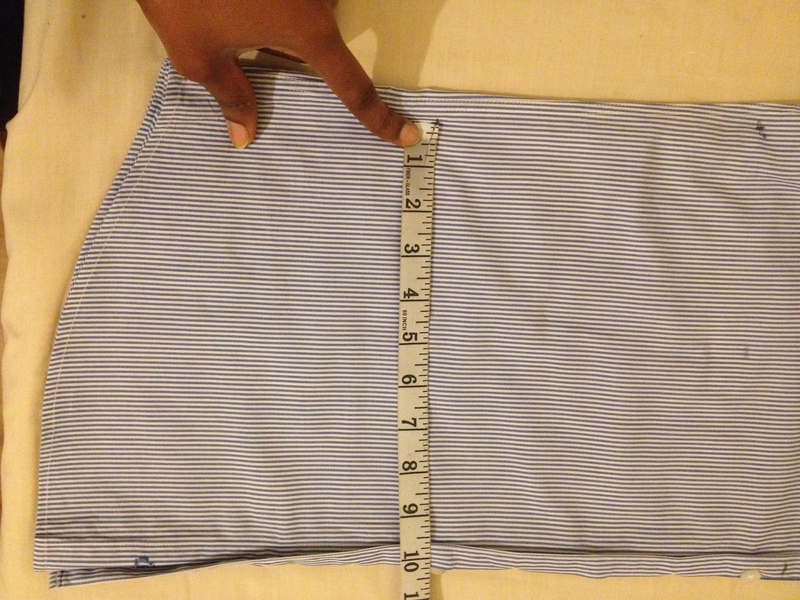 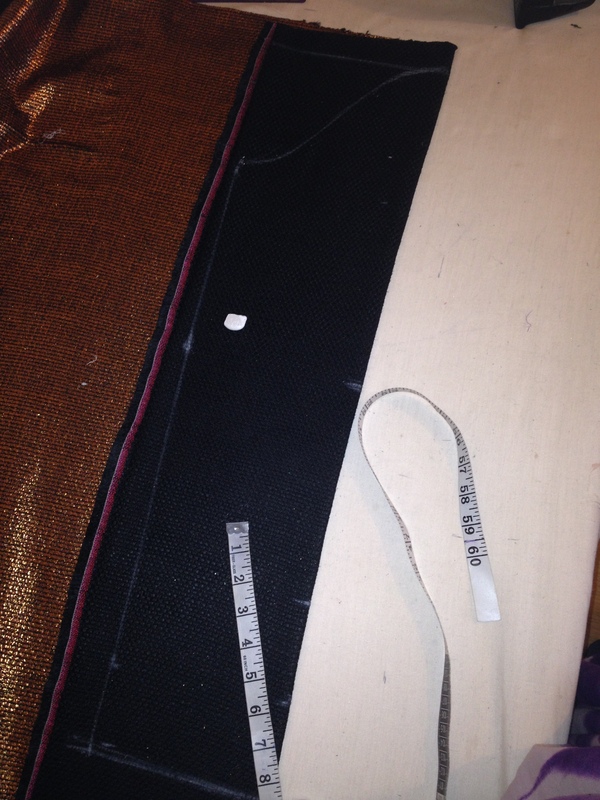 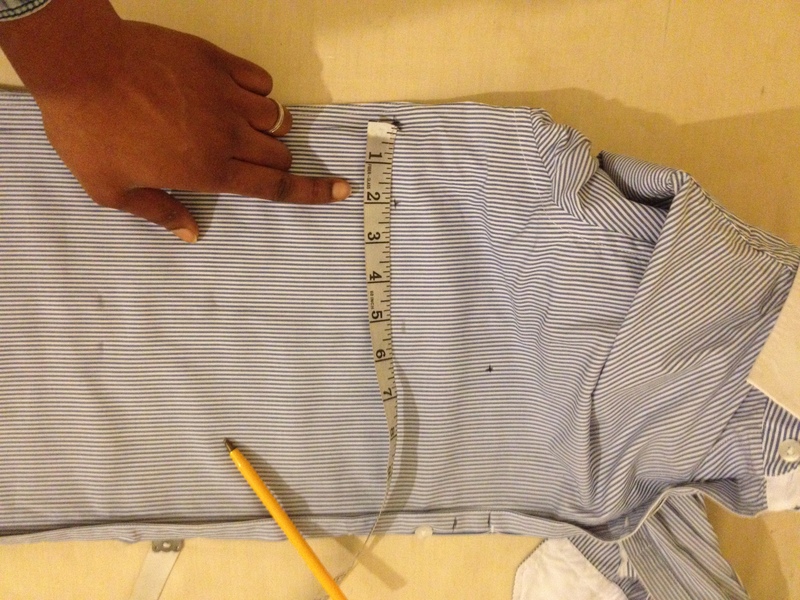 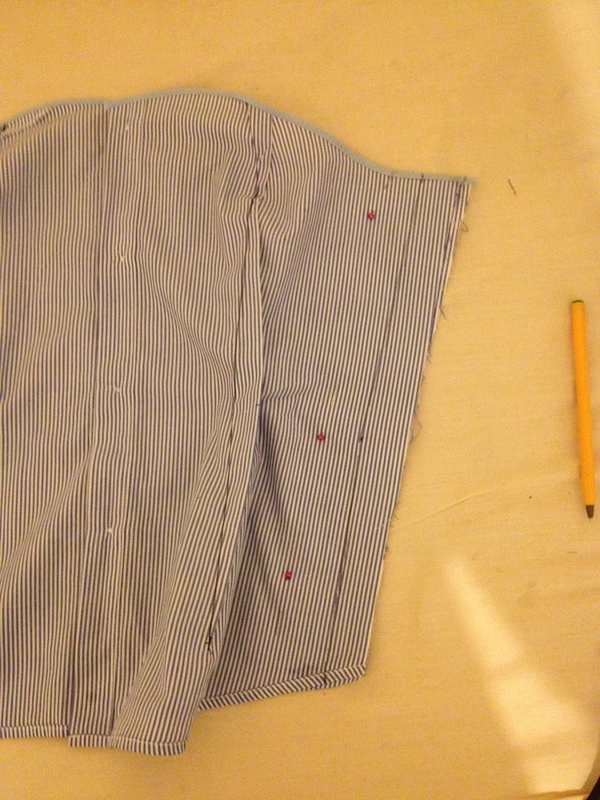 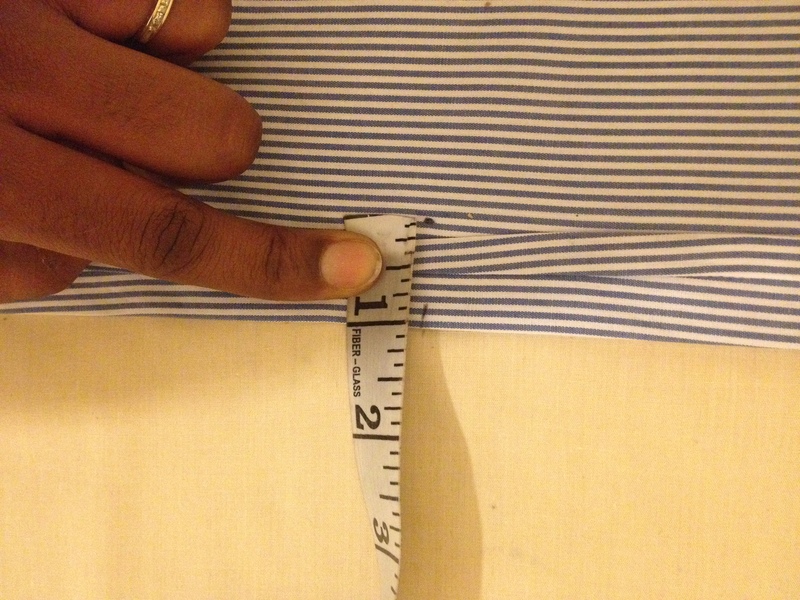 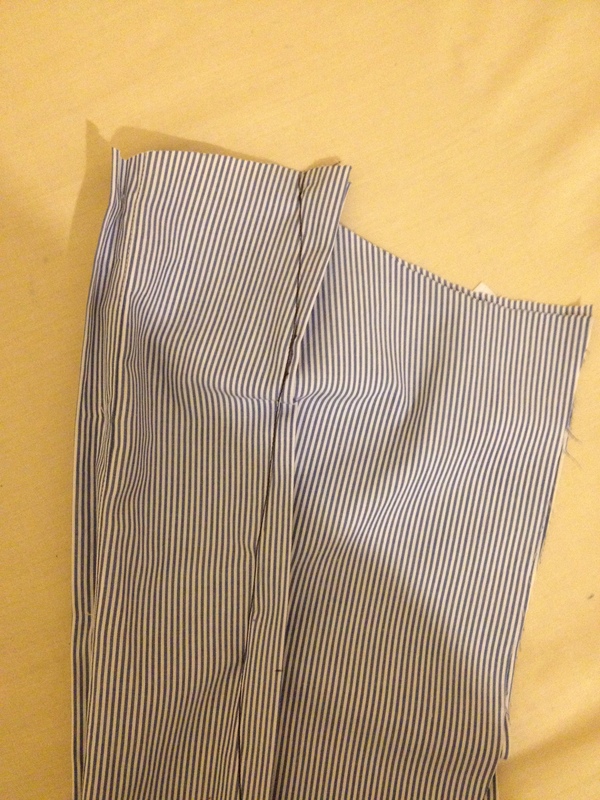 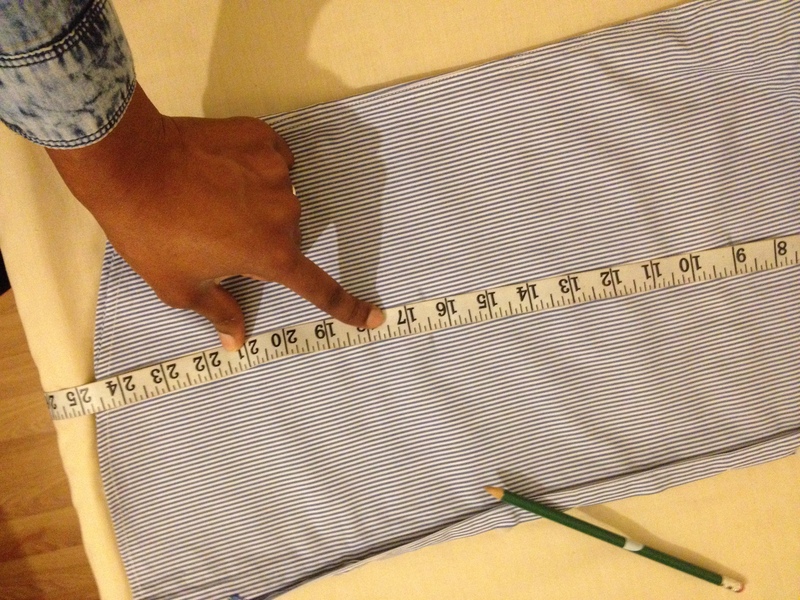 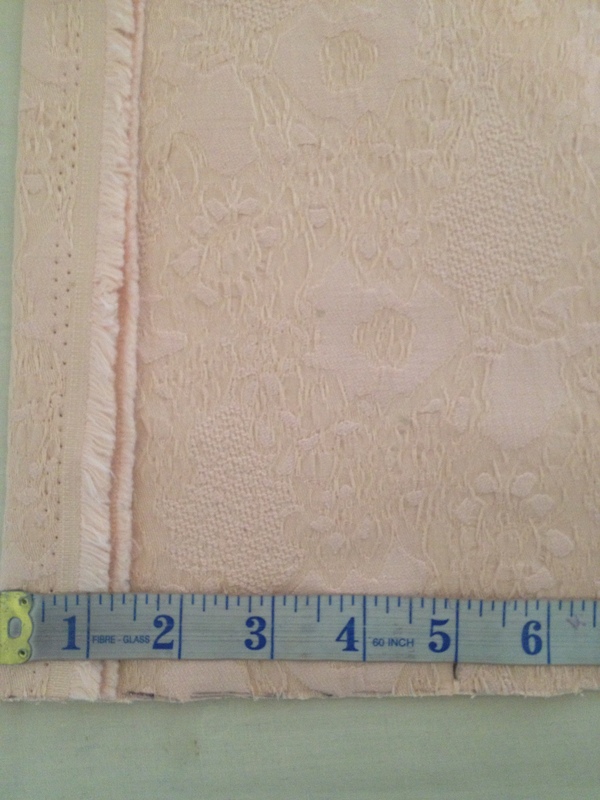 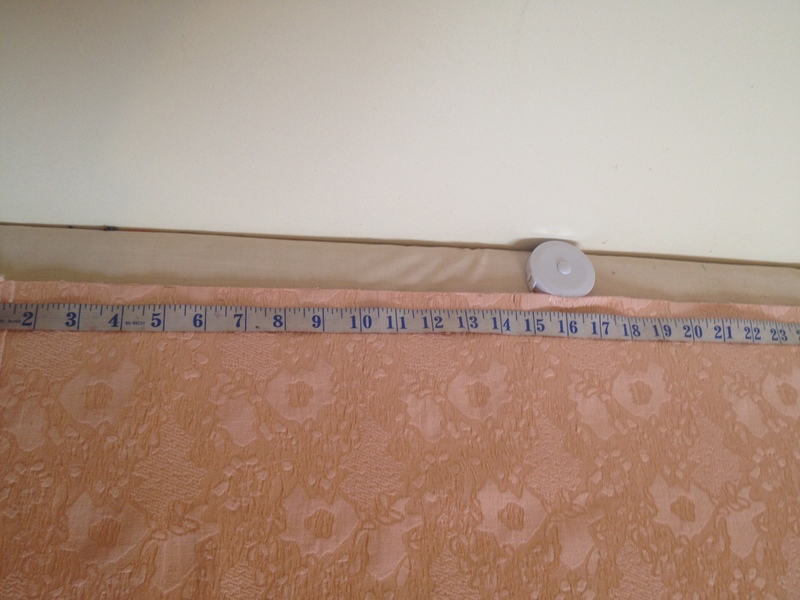 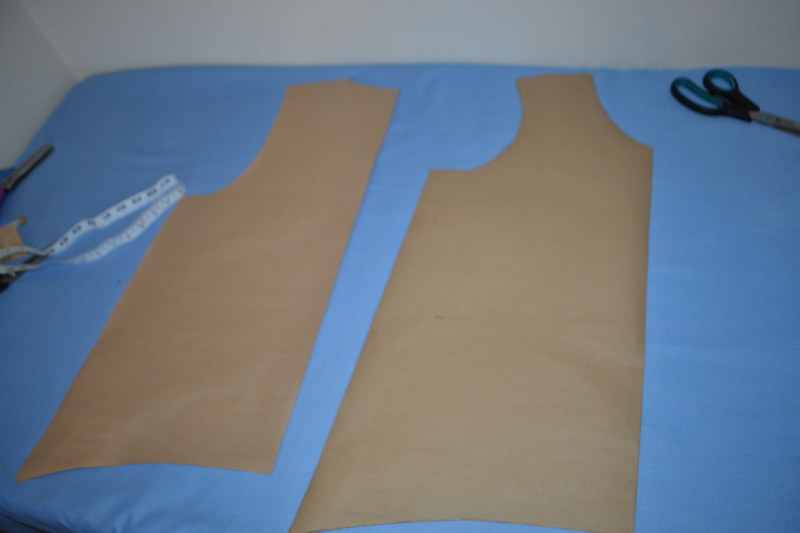 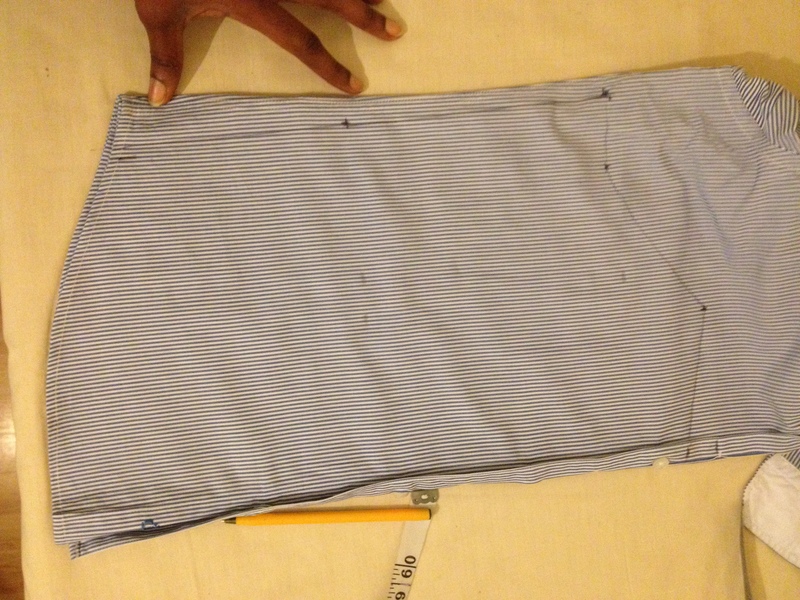 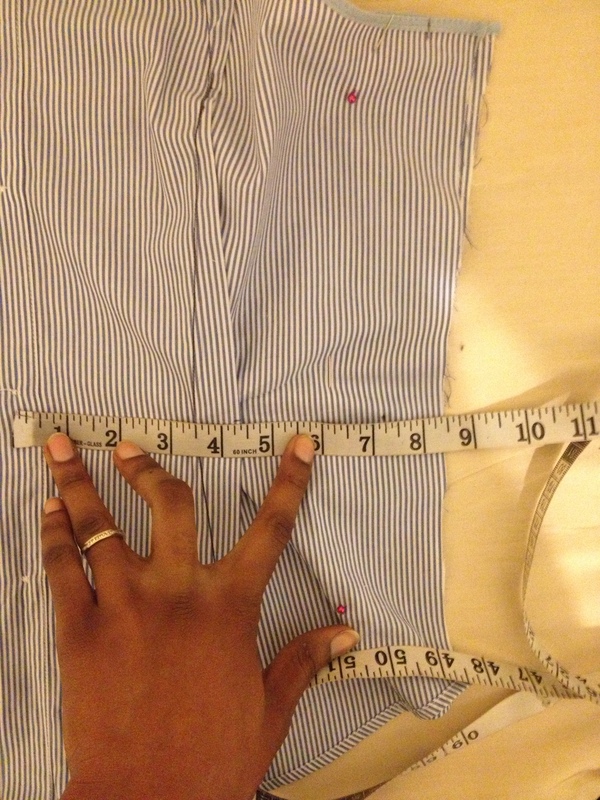 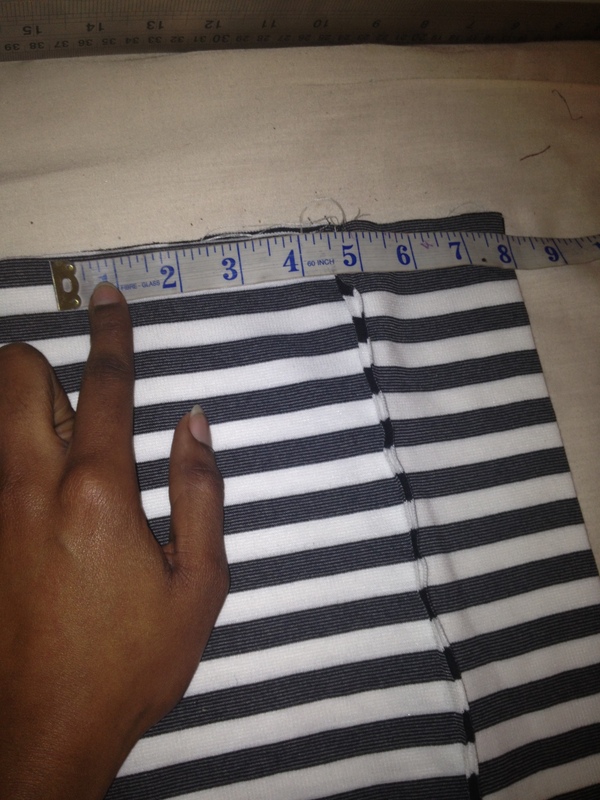 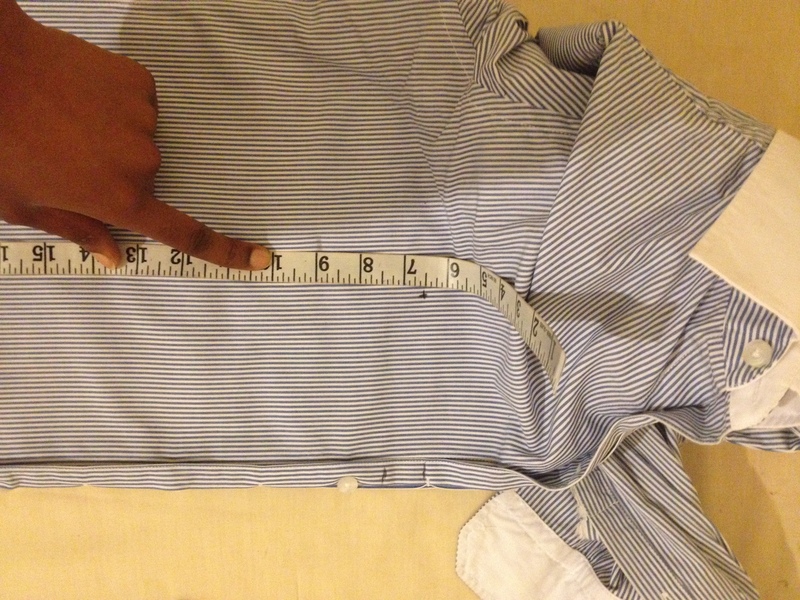 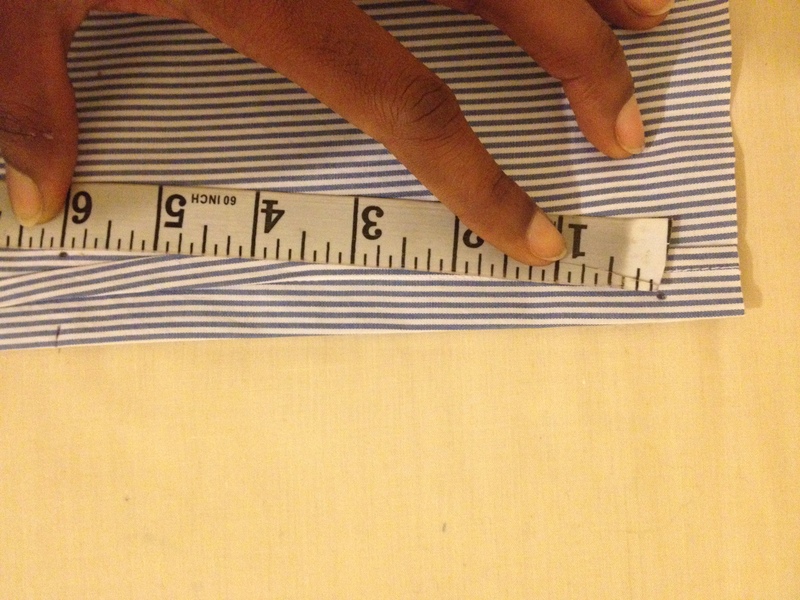 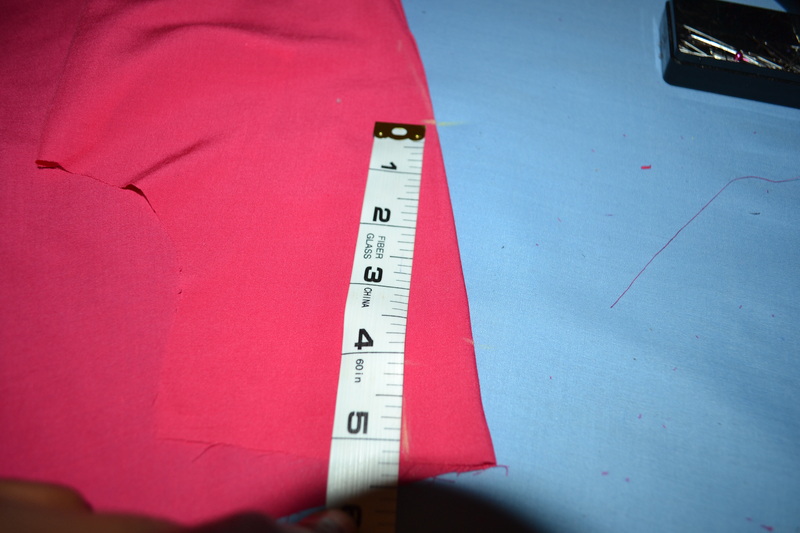 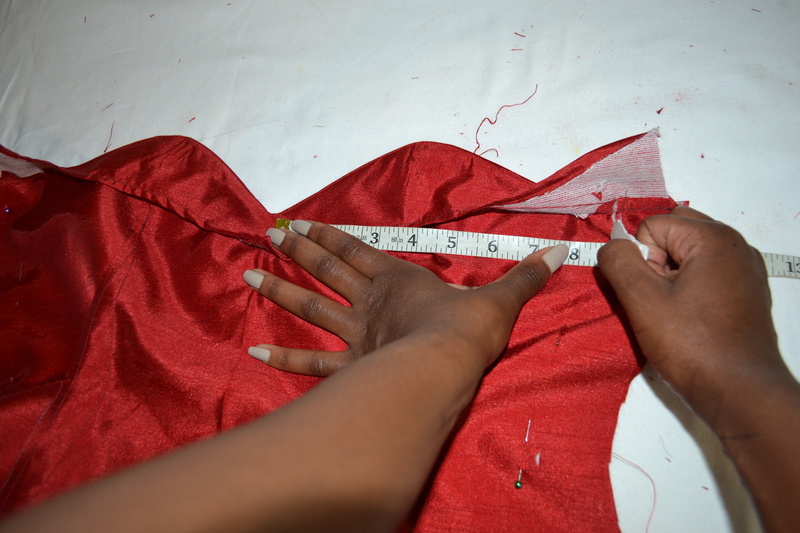 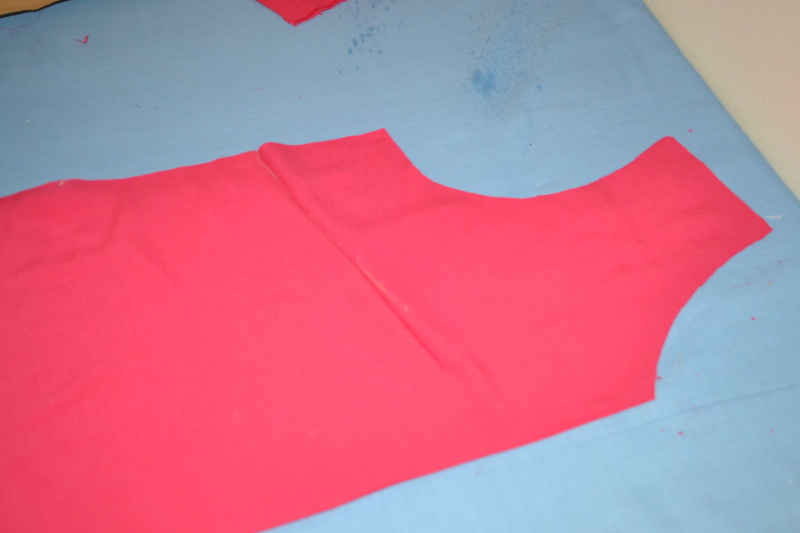 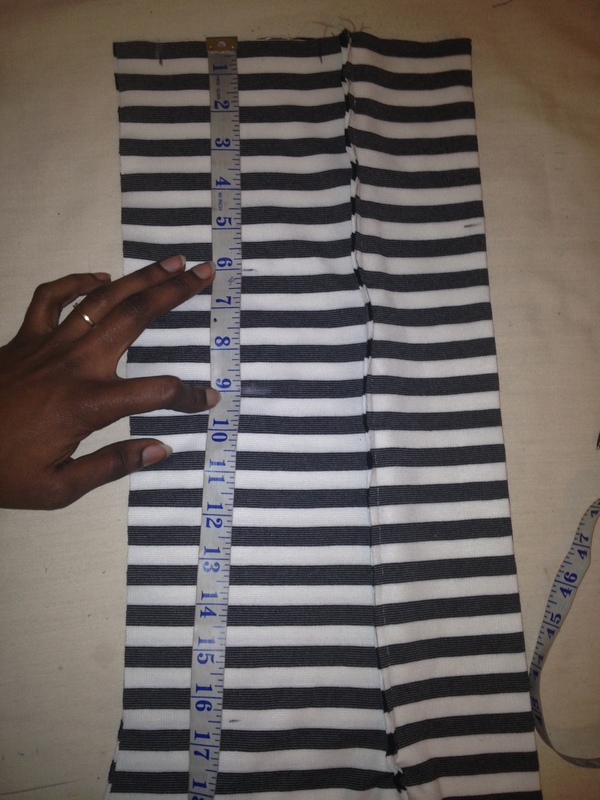 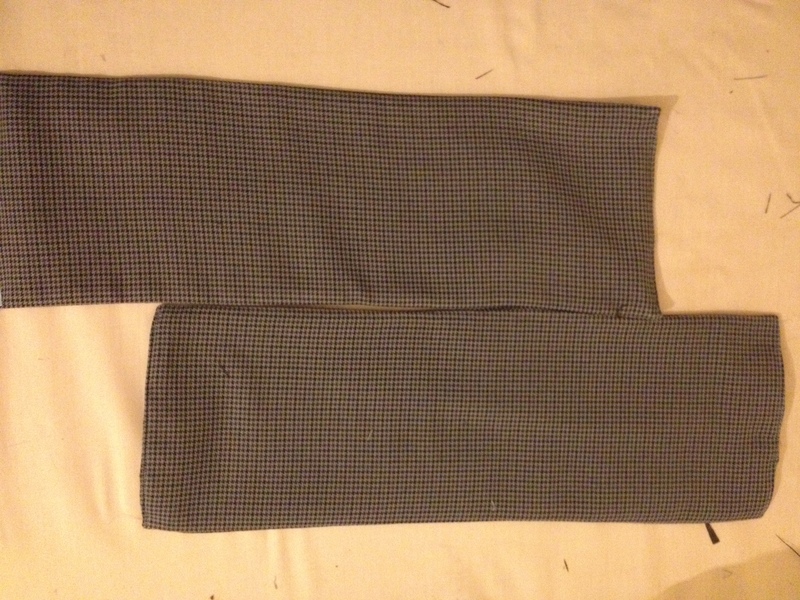 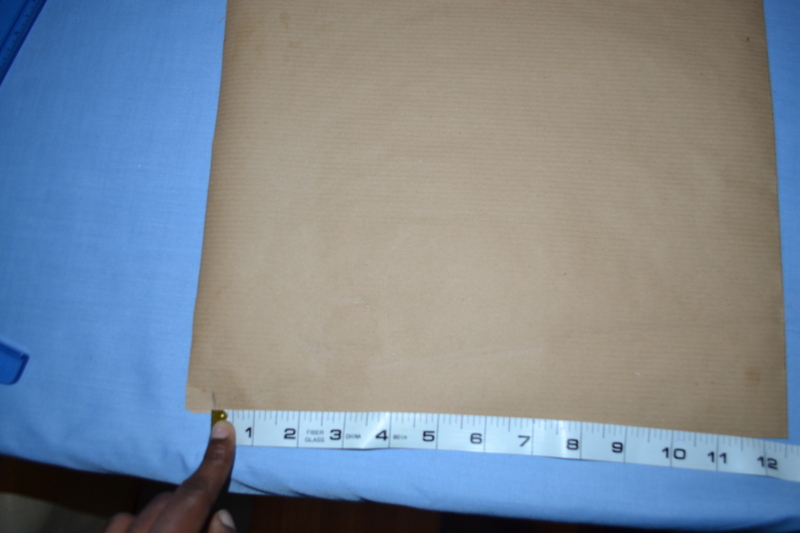 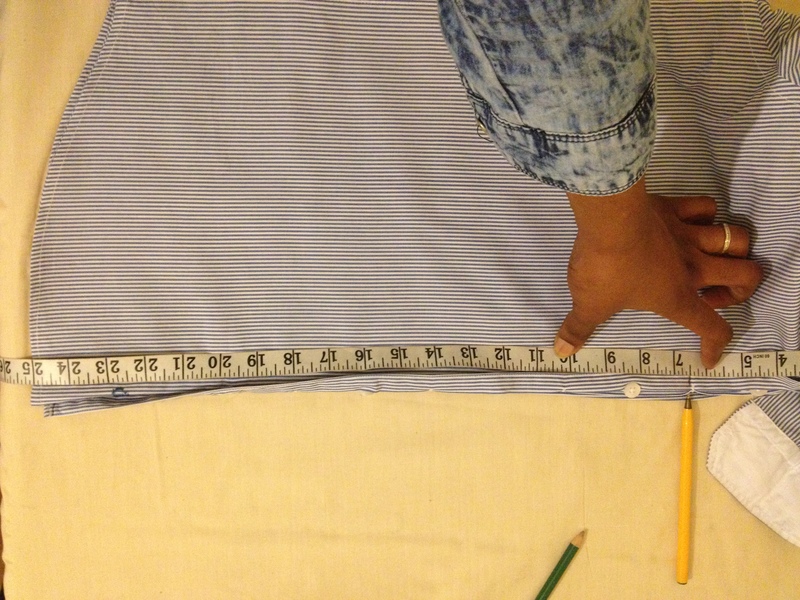 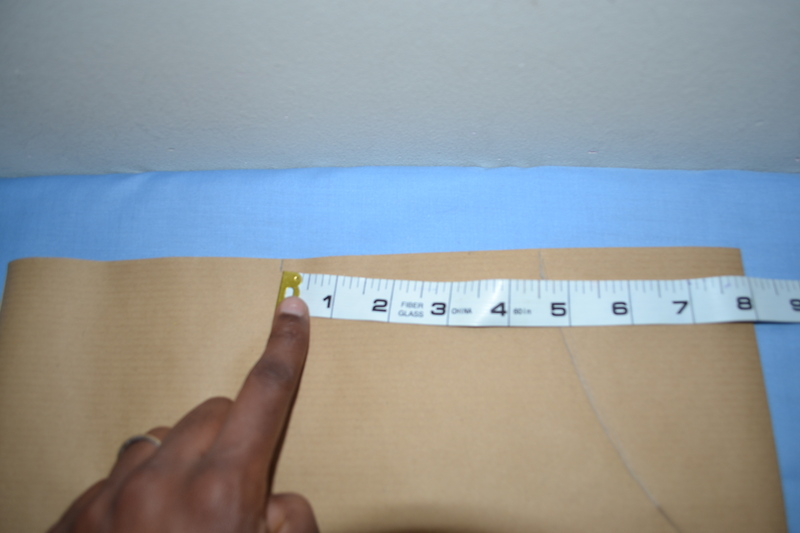 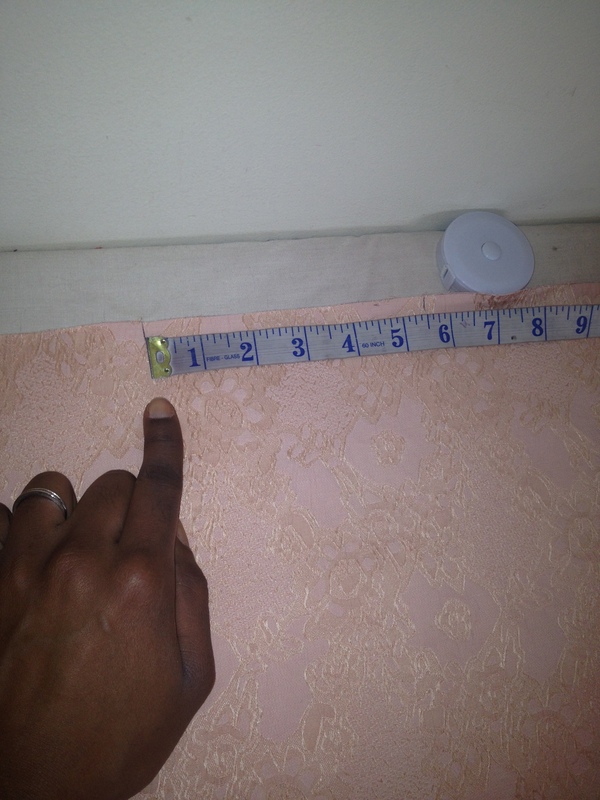 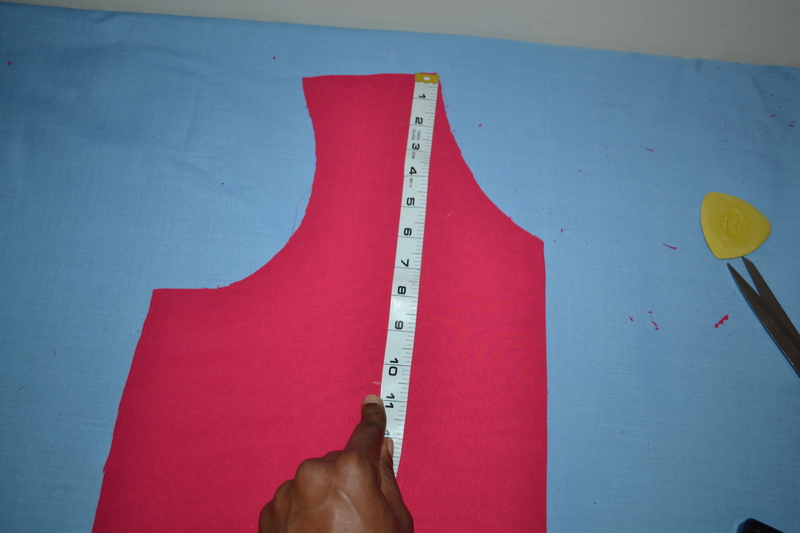 Divide your hip measurement by 4 + 2″ and mark along the bottom of the shirt. 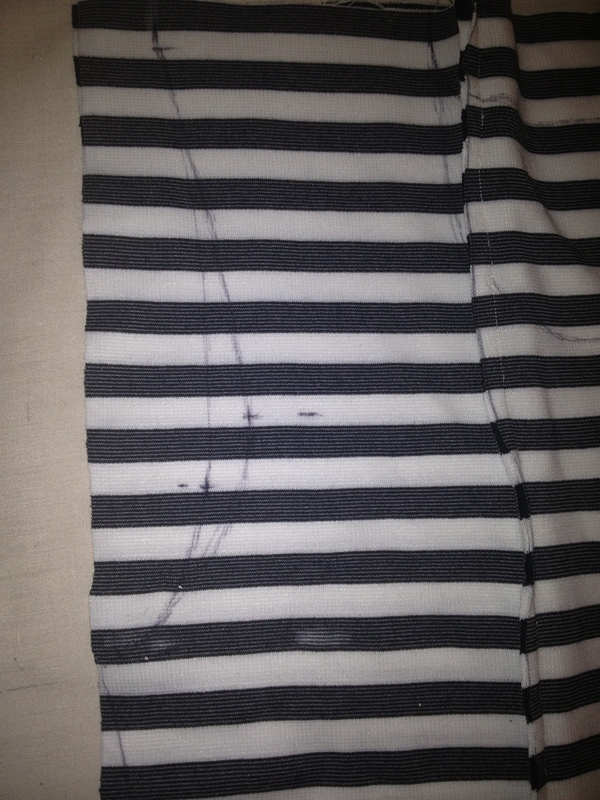 Using a ruler or freehand if you like, draw lines that join all the marks along the top. 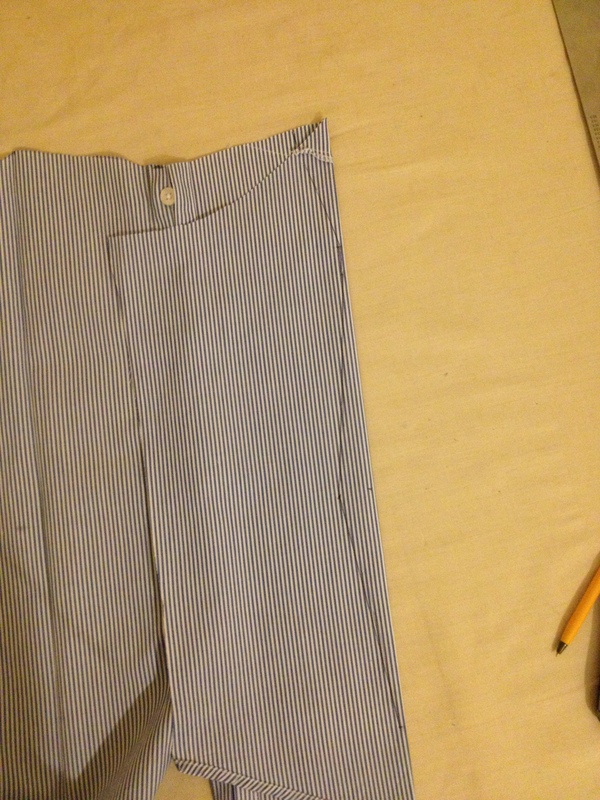 It should look like this: Note the button right at the top. 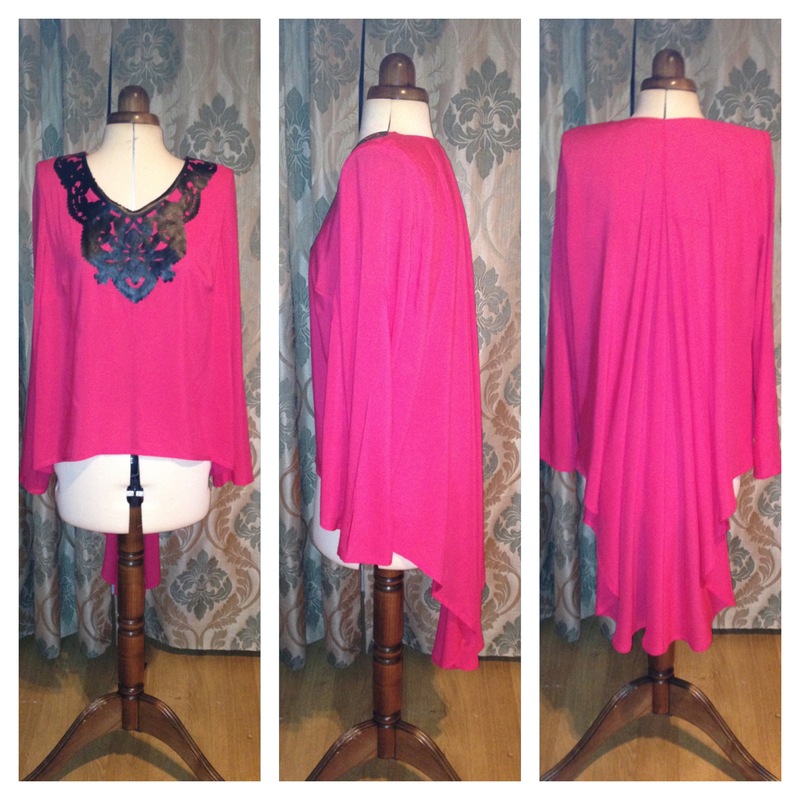 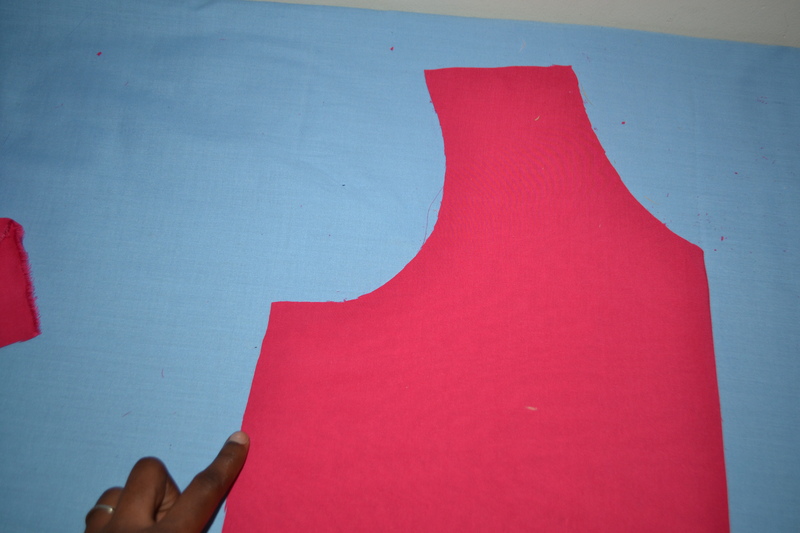 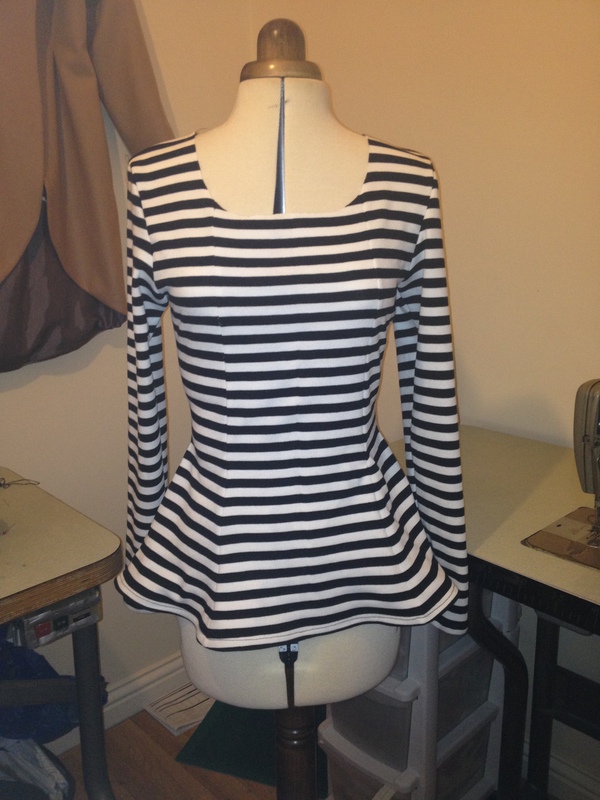 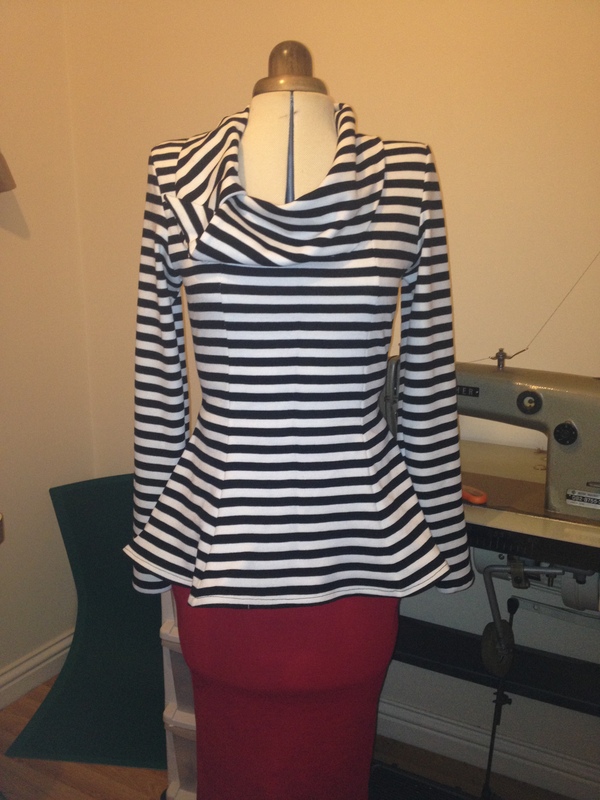 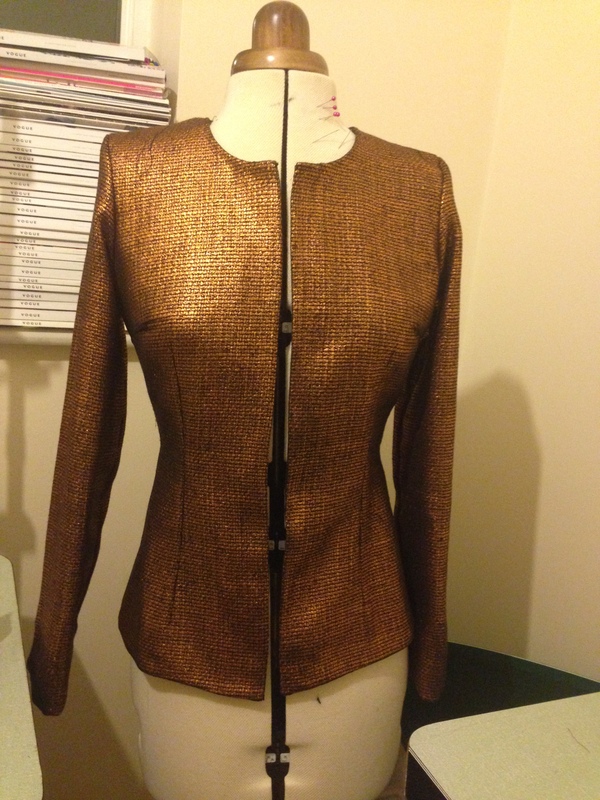 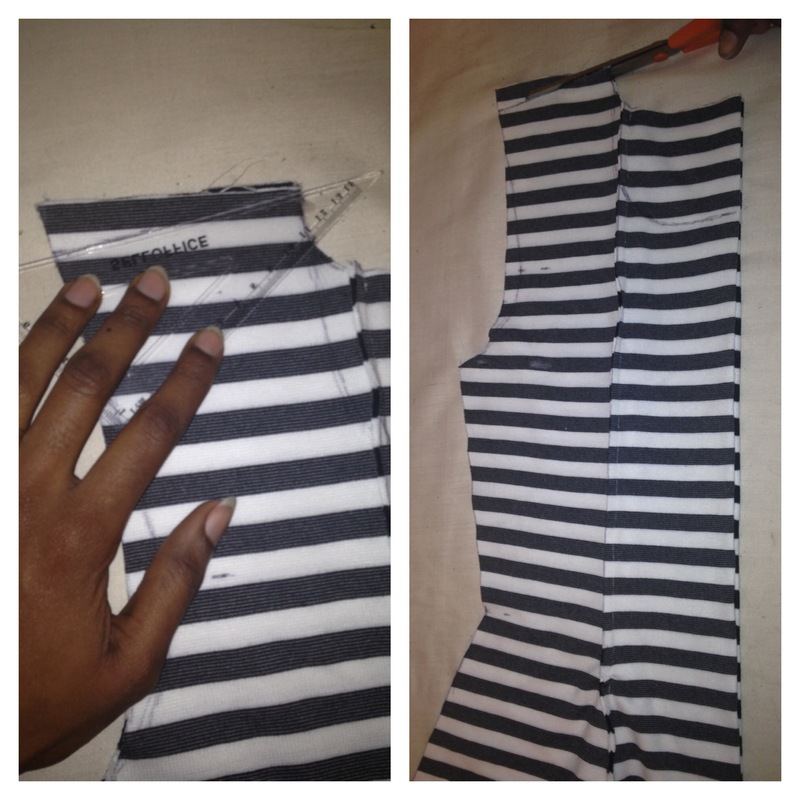 Cut this out and separate the front and back of the top. 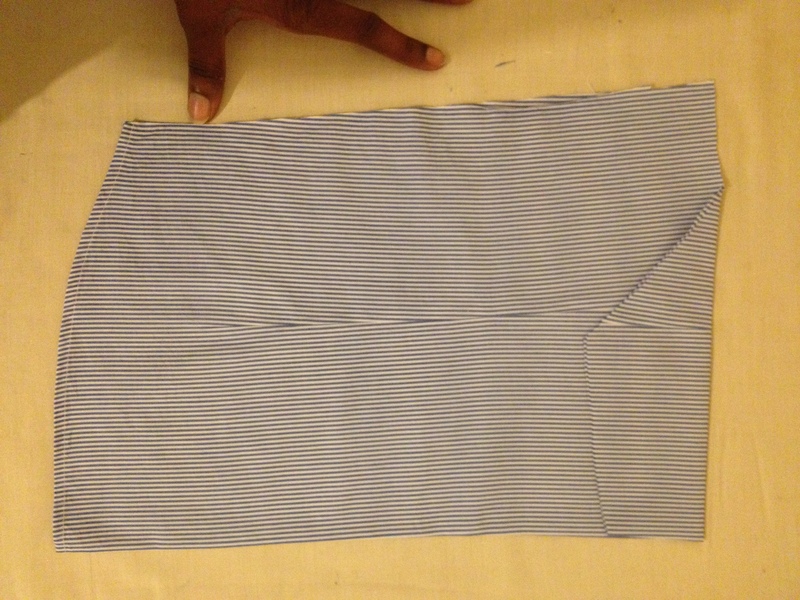 Do he same with the front piece. 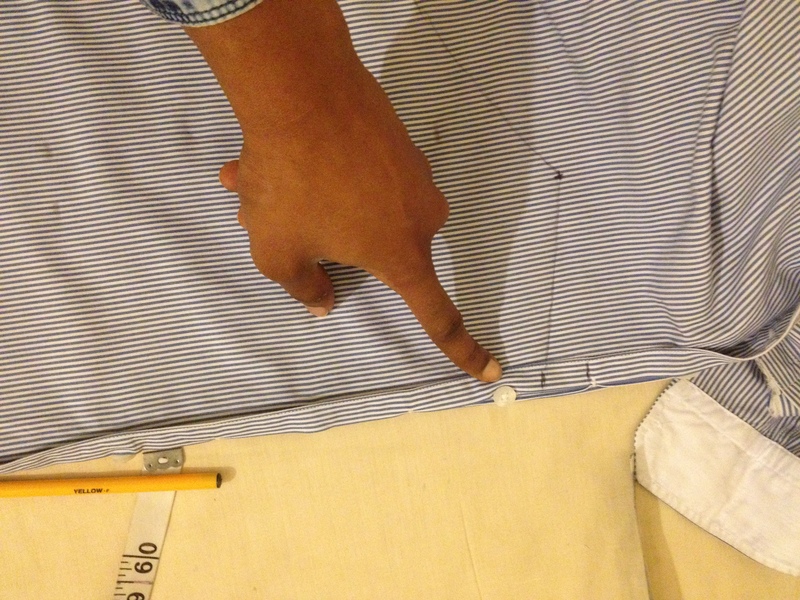 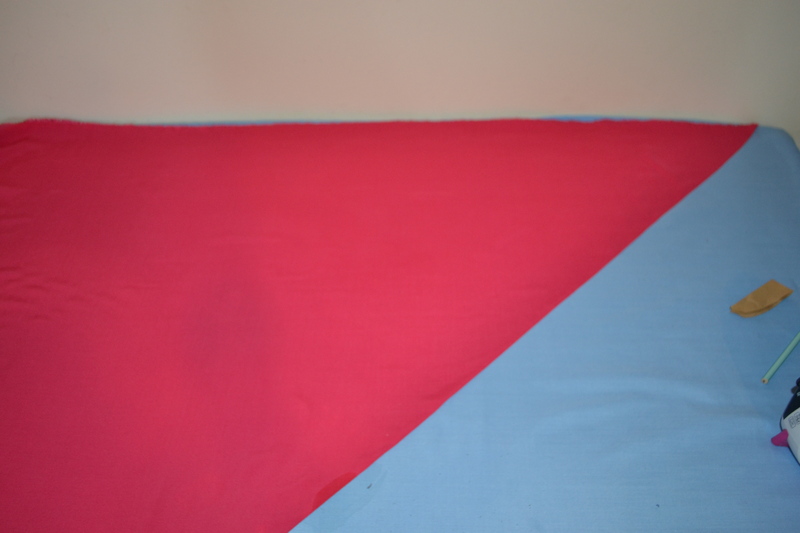 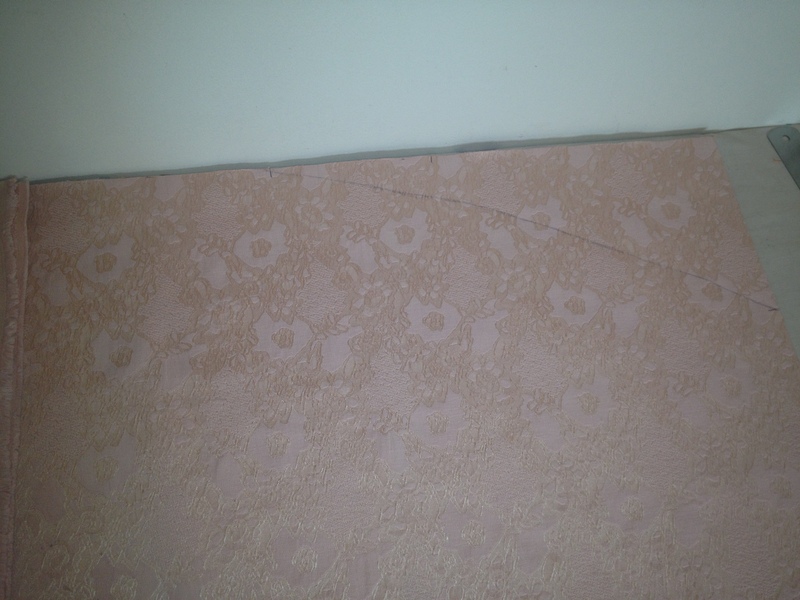 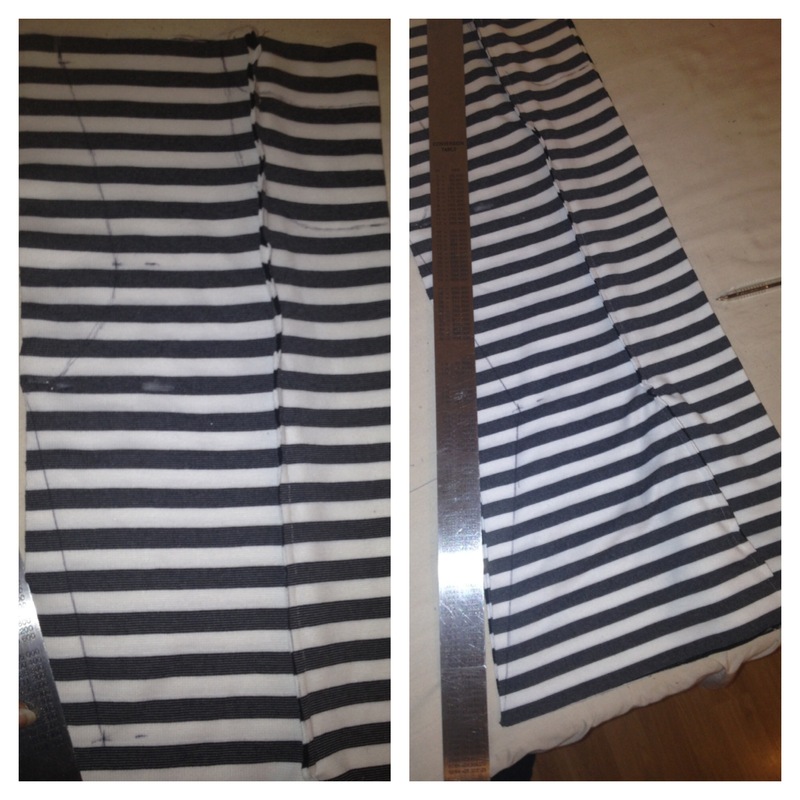 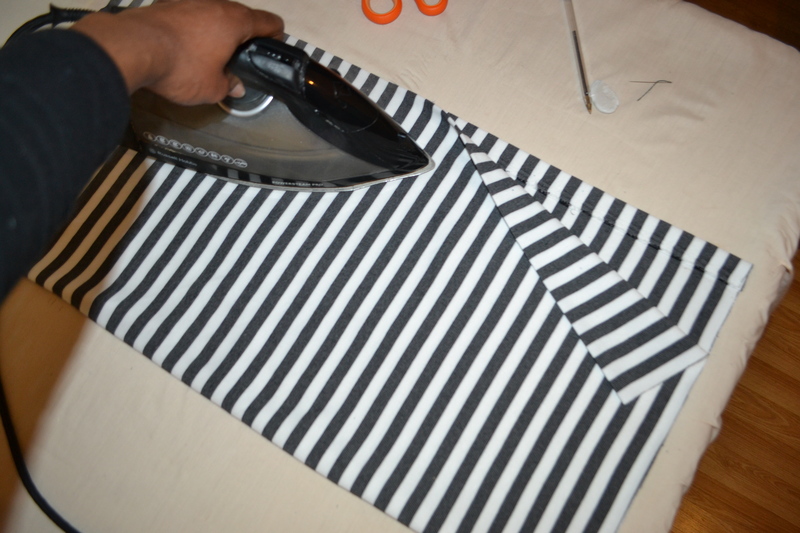 These creases you just ironed in will create your dart lines. 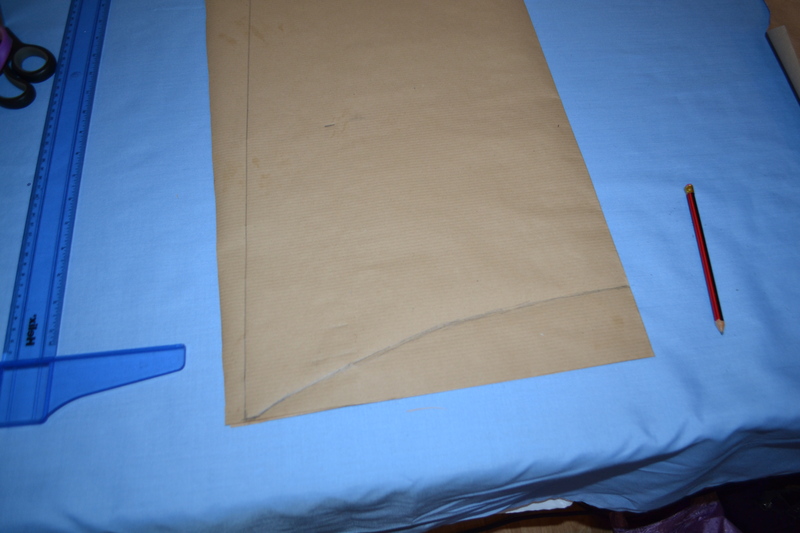 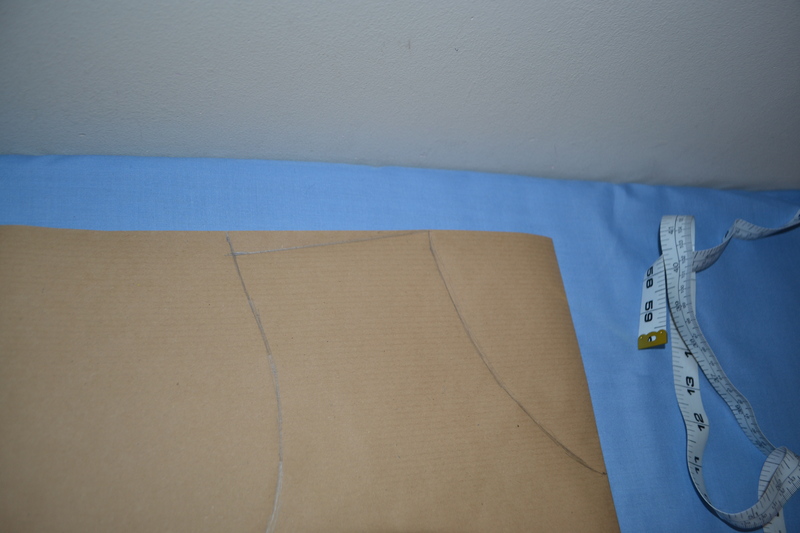 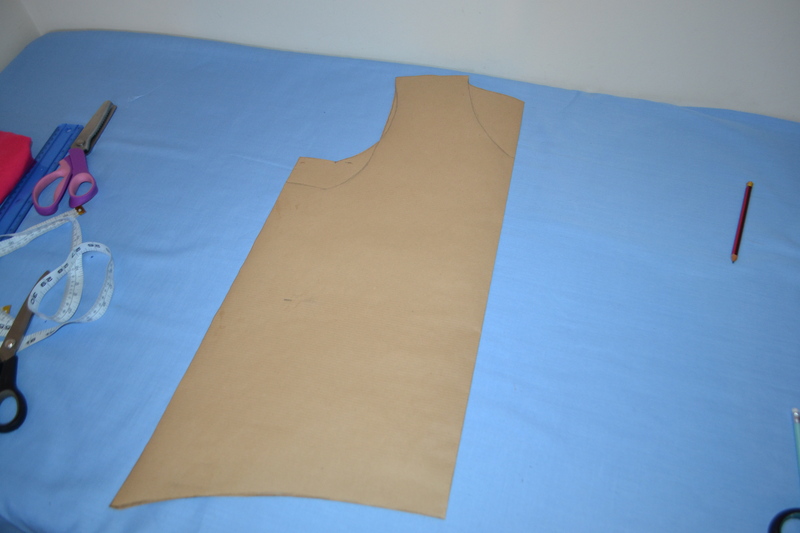 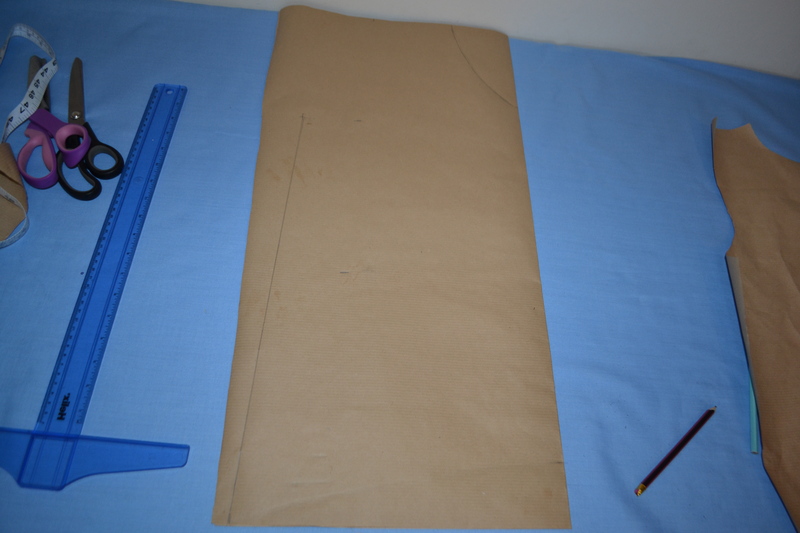 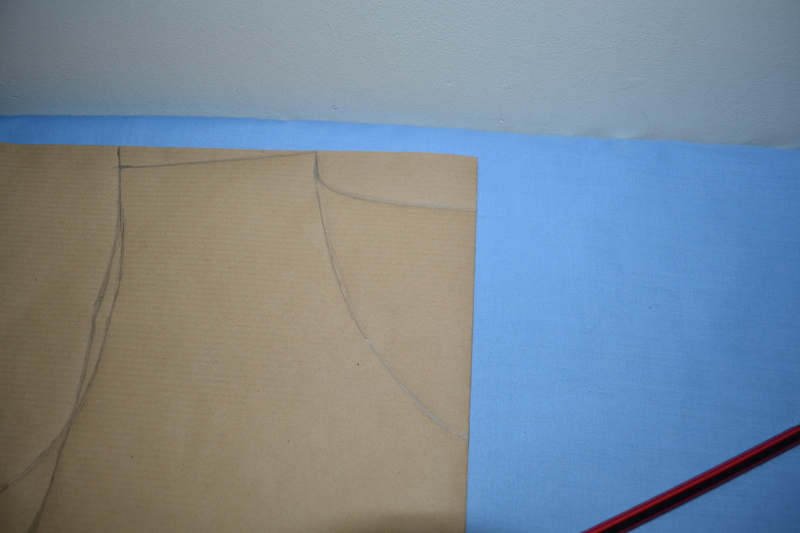 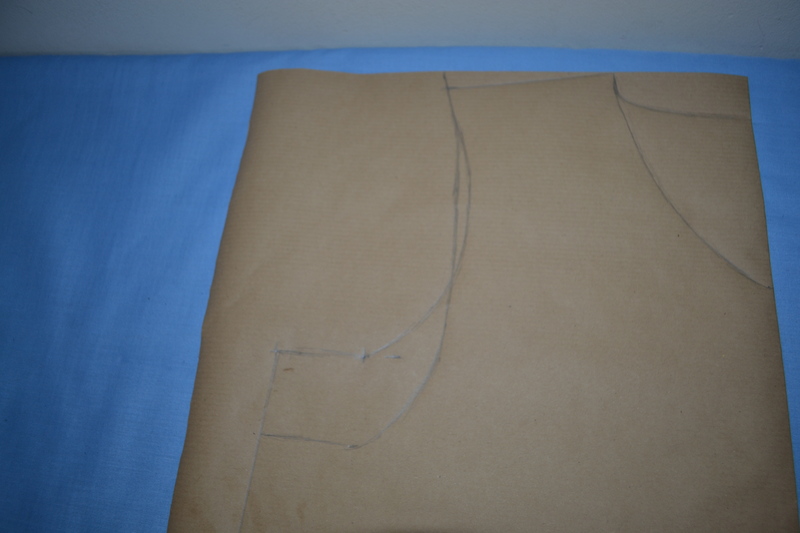 Unfold the front and back pieces and invert the crease lines that are facing outwards, you do this because you will be drawing in your darts on the inside of the top. 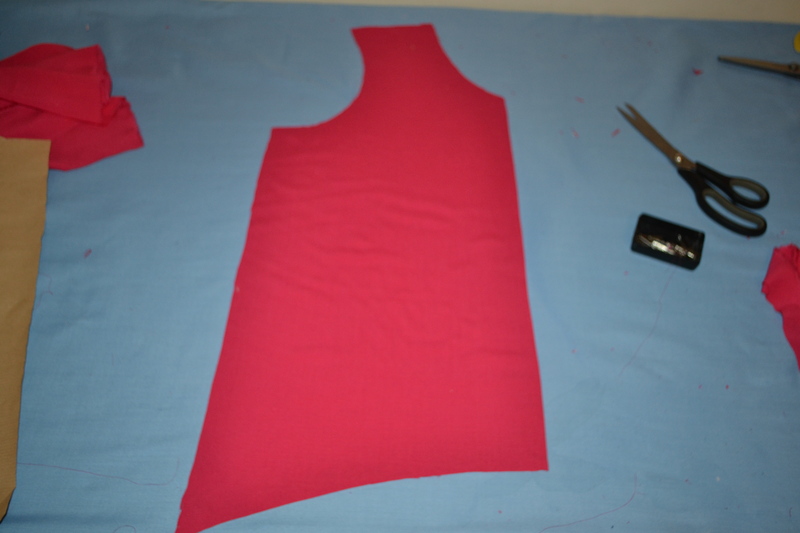 Give the front and back darts a good press. 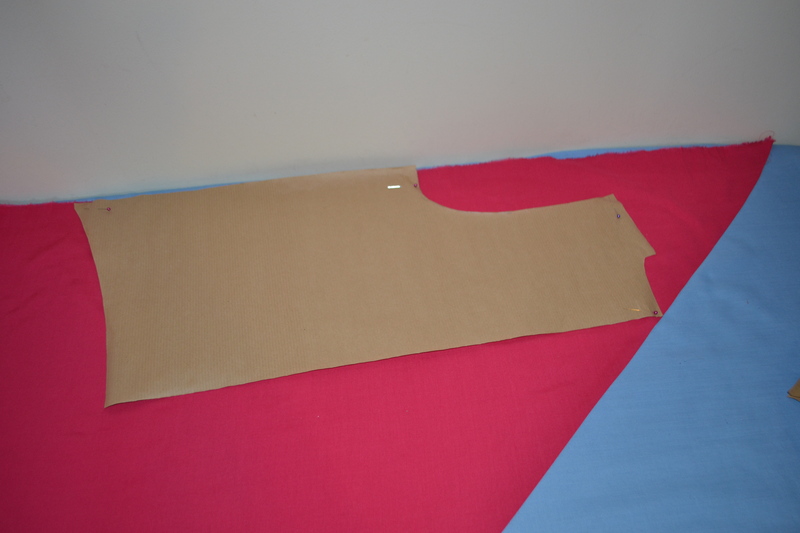 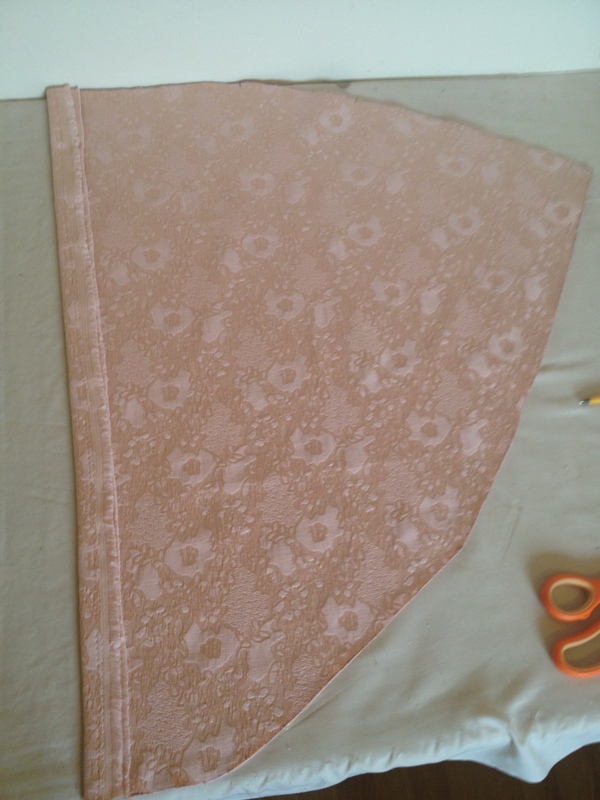 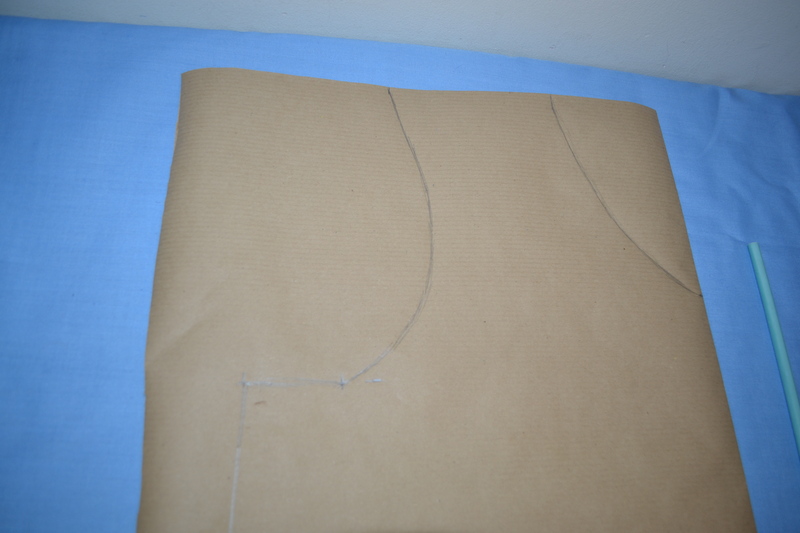 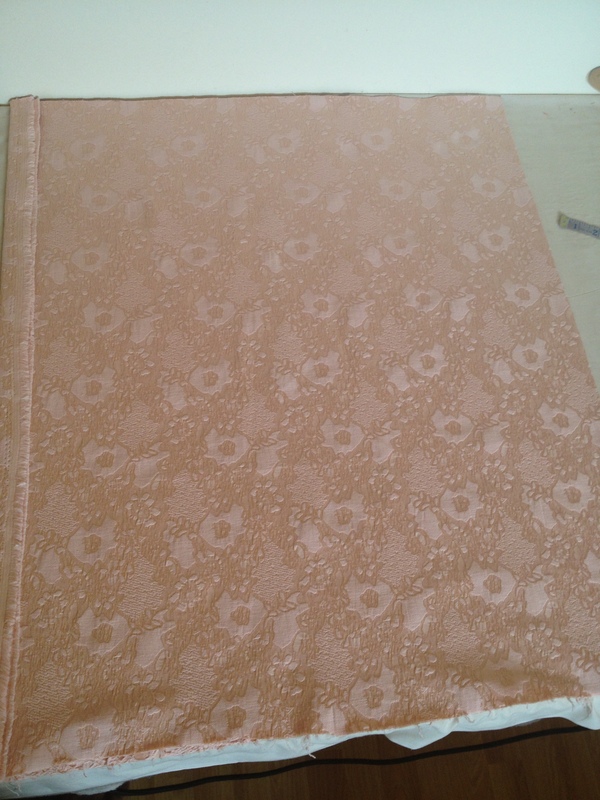 Use some bias binding of your choice to finish off the top edges, lay the back and front pieces on top of each other, right sides facing, line up the side seams and pin to secure together. 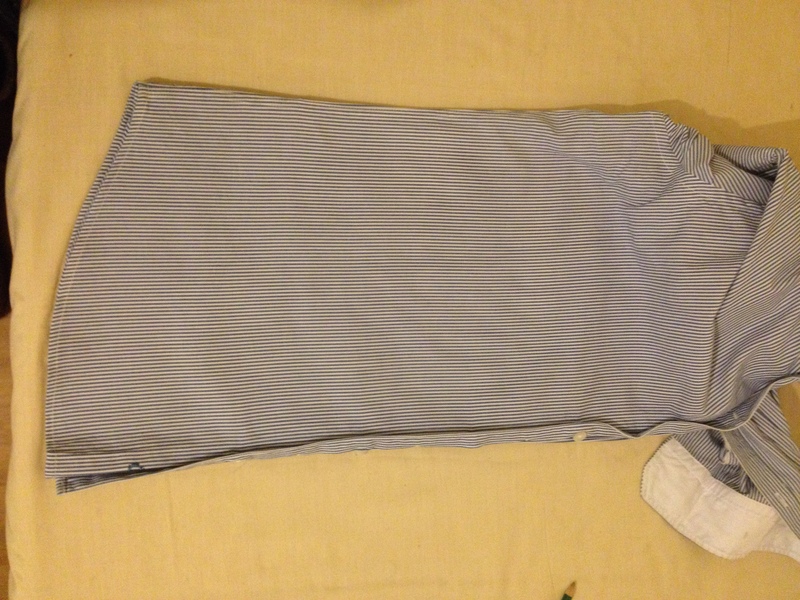 Flip the shirt round and repeat. 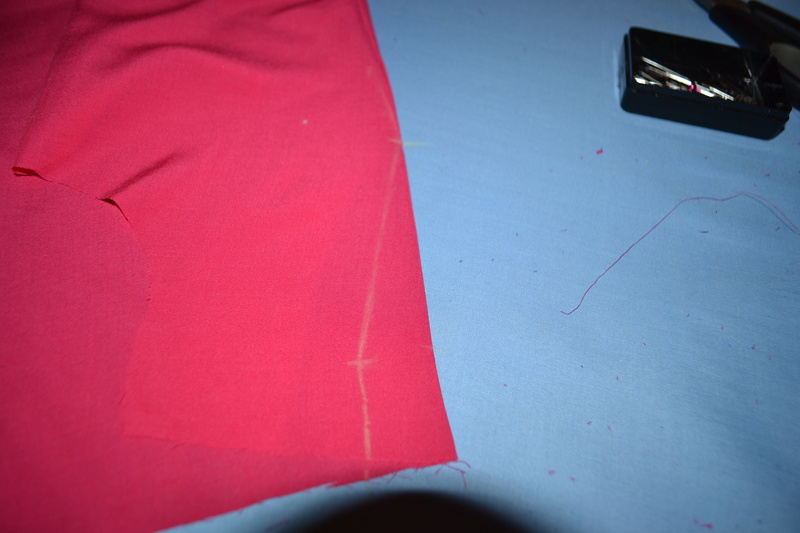 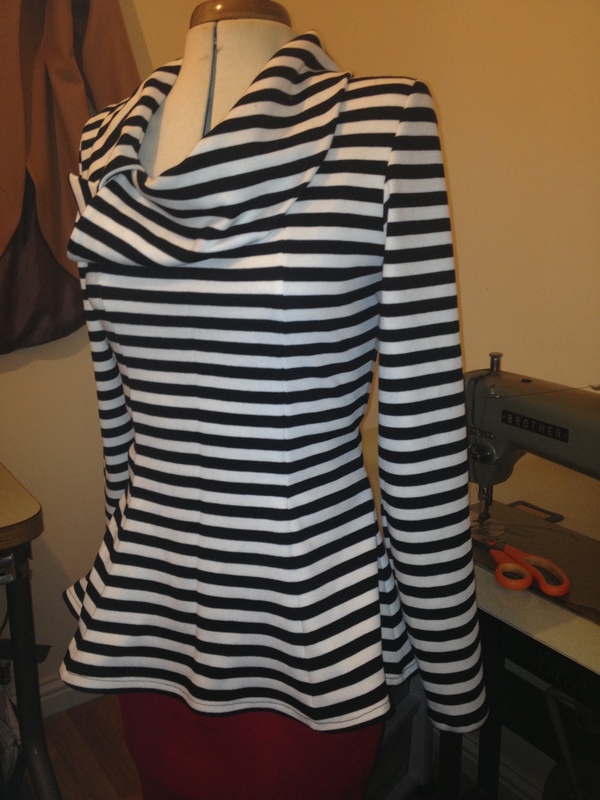 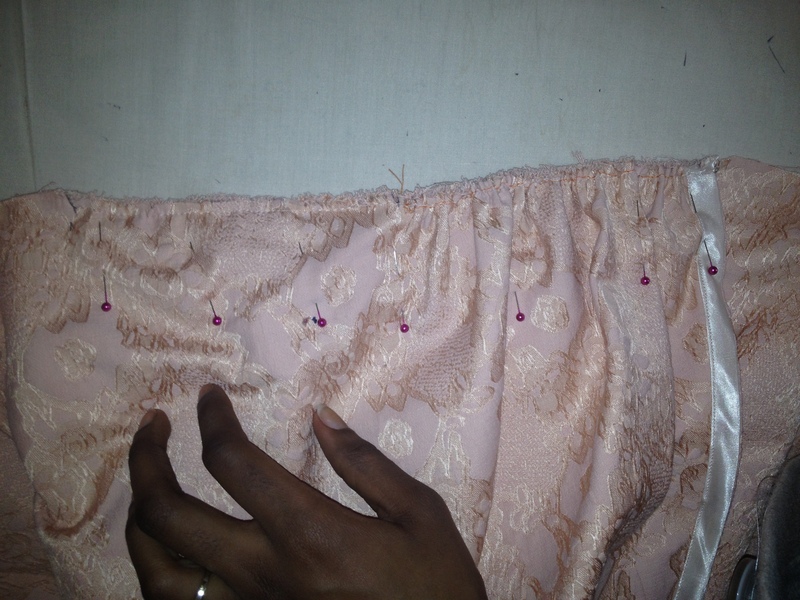 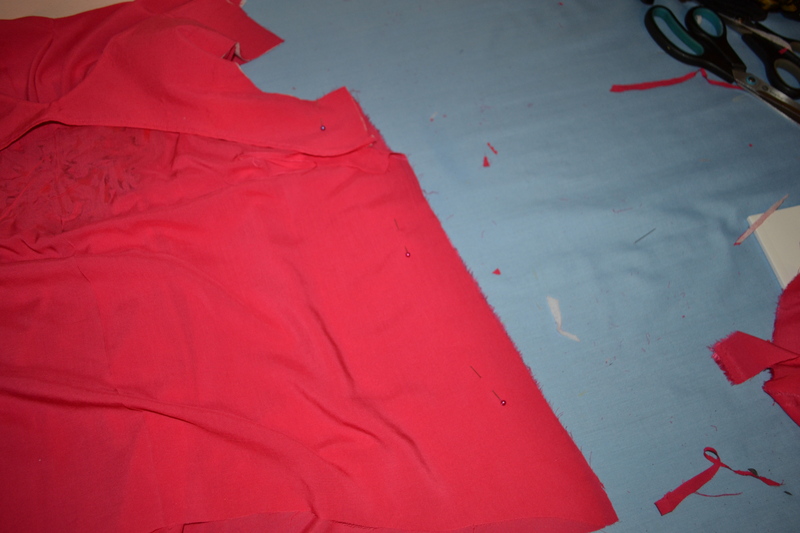 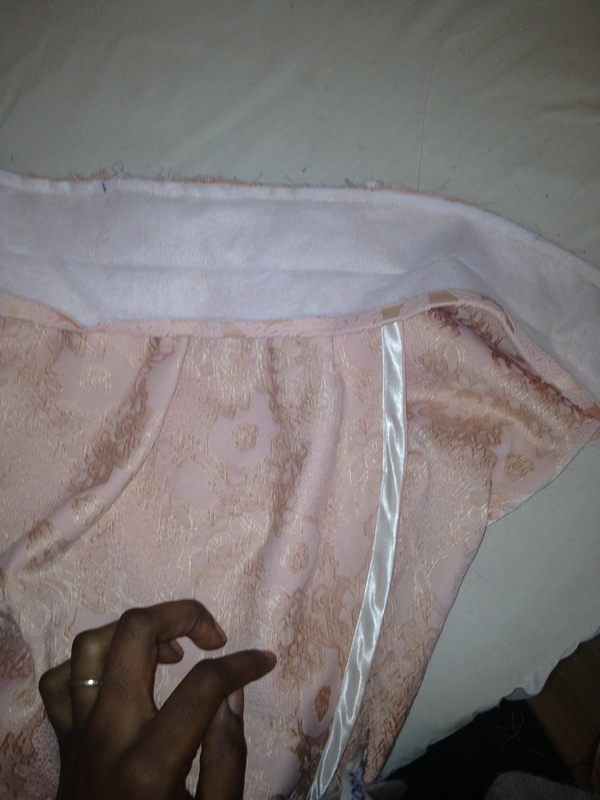 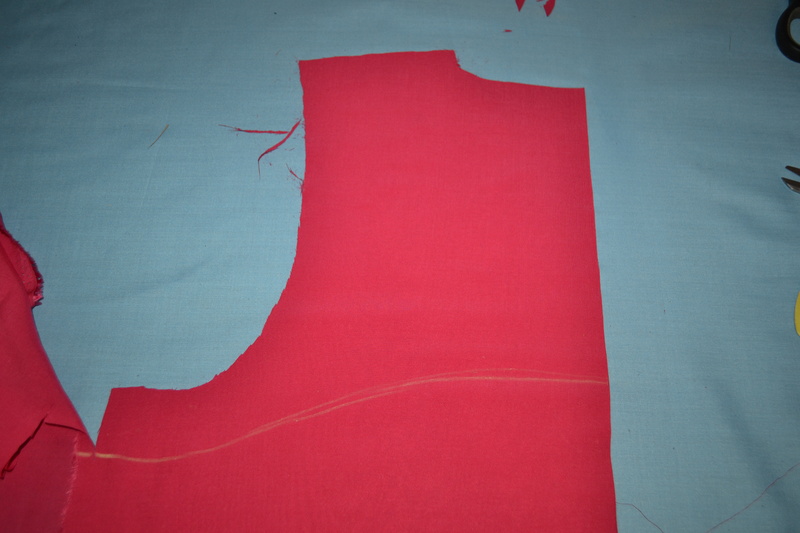 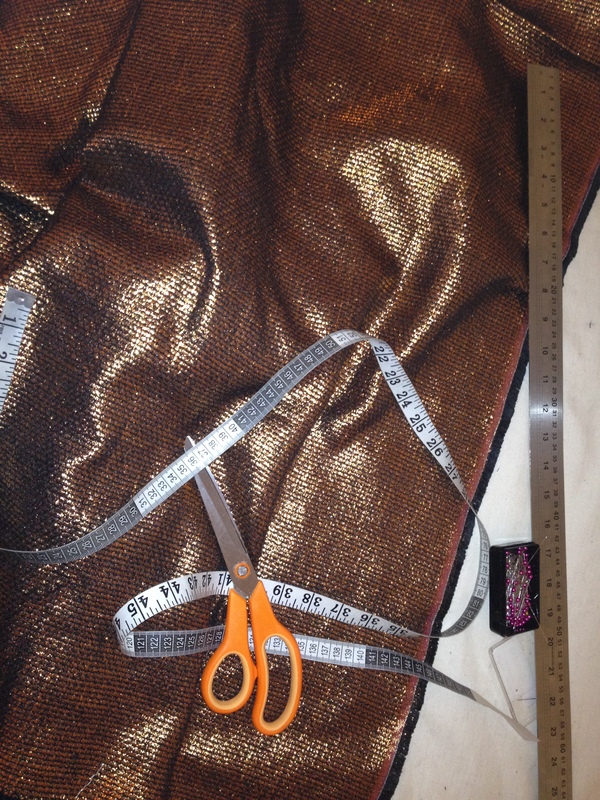 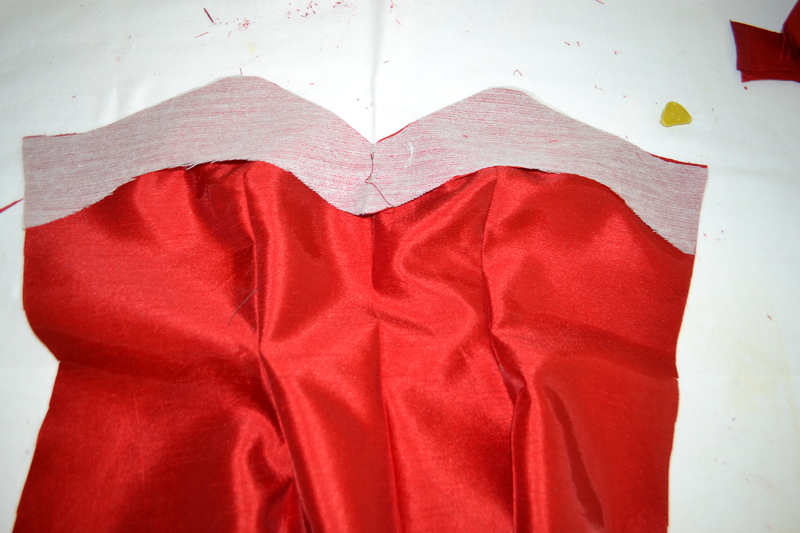 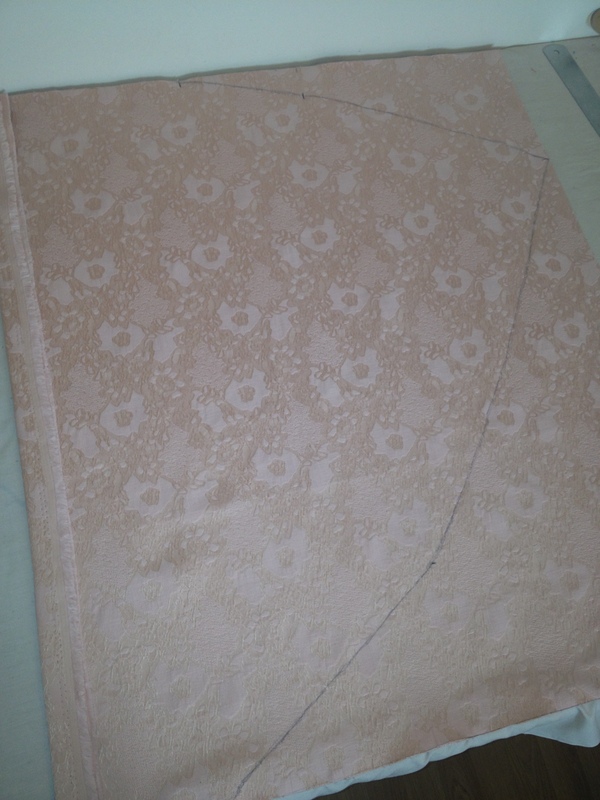 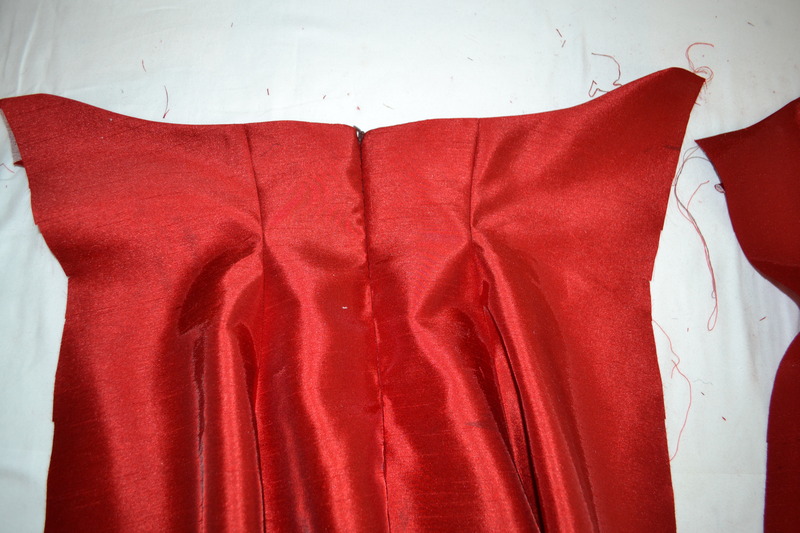 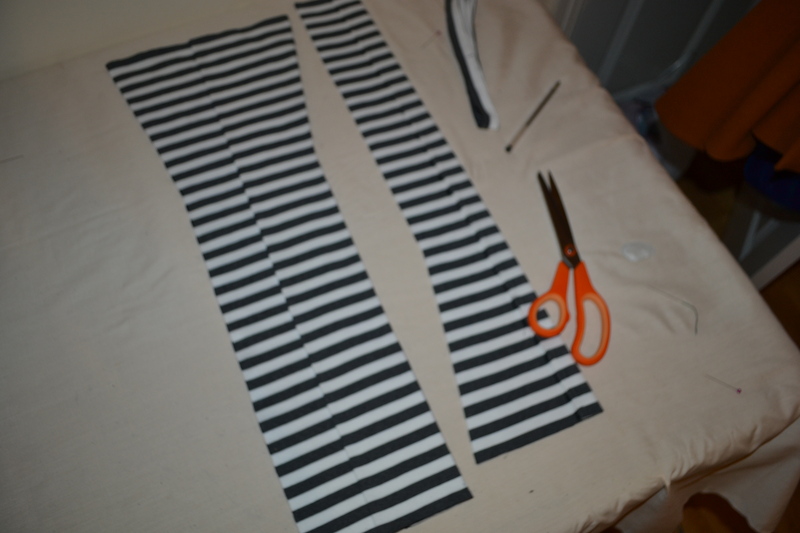 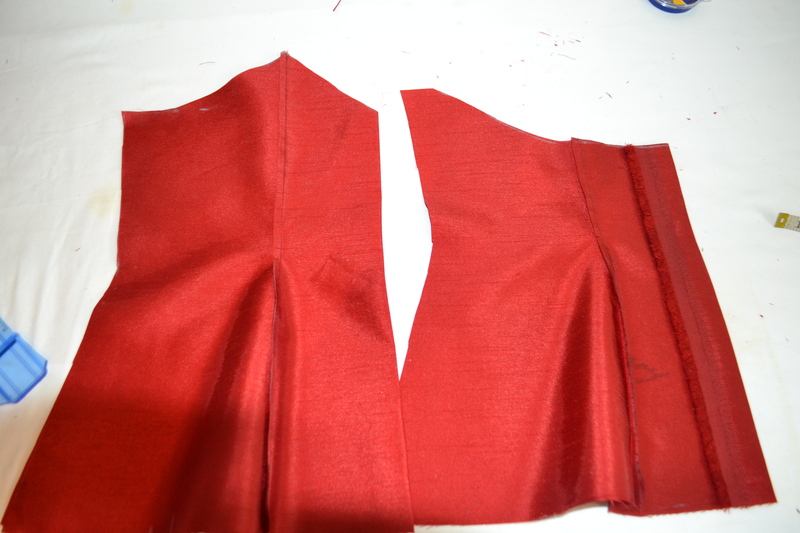 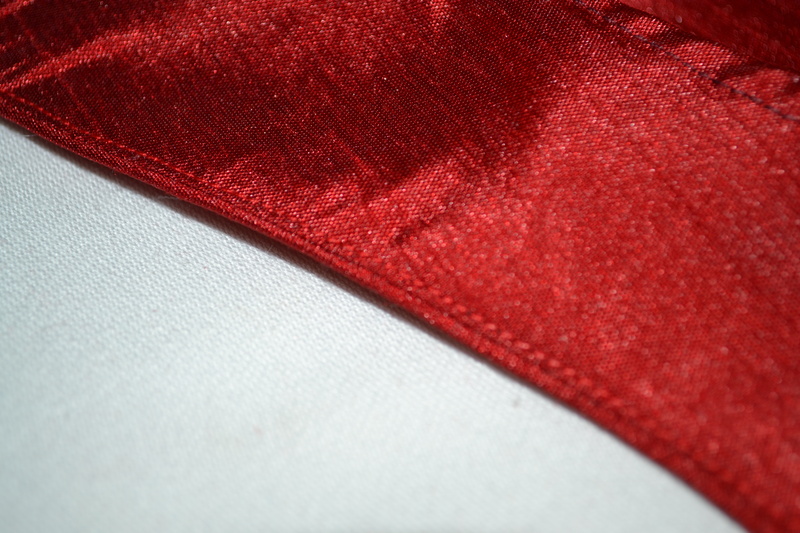 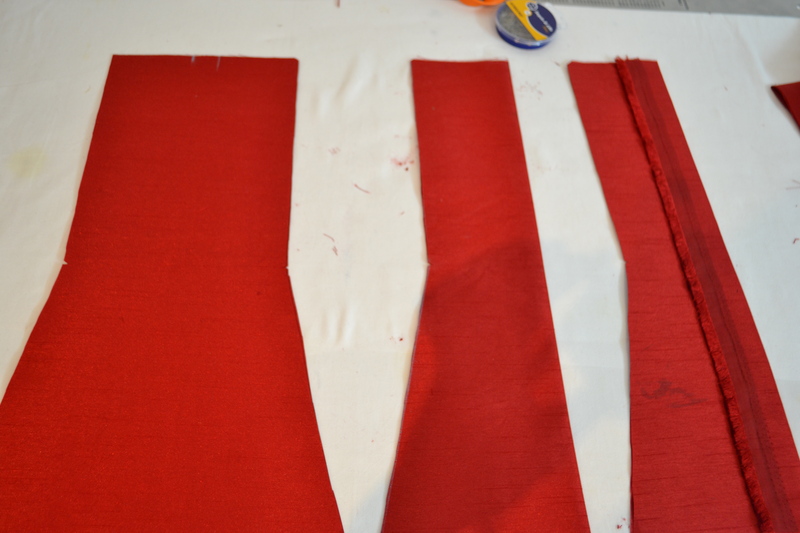 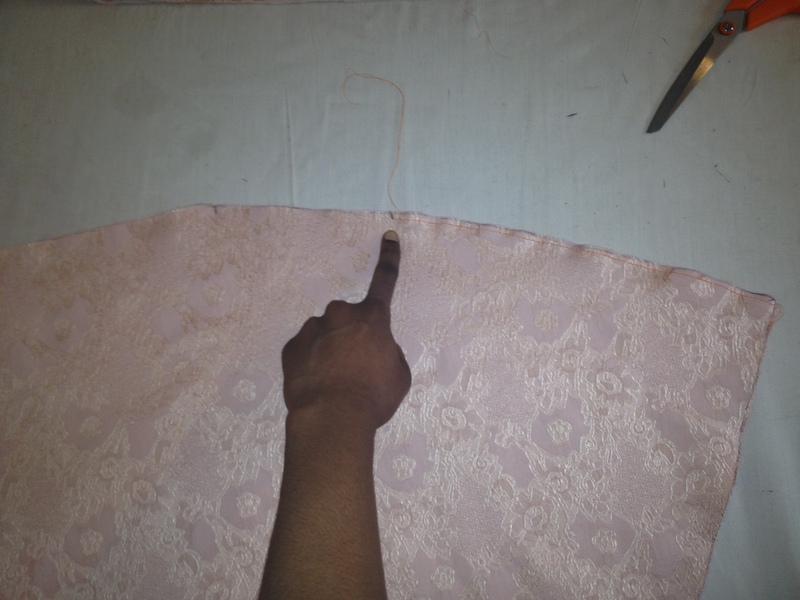 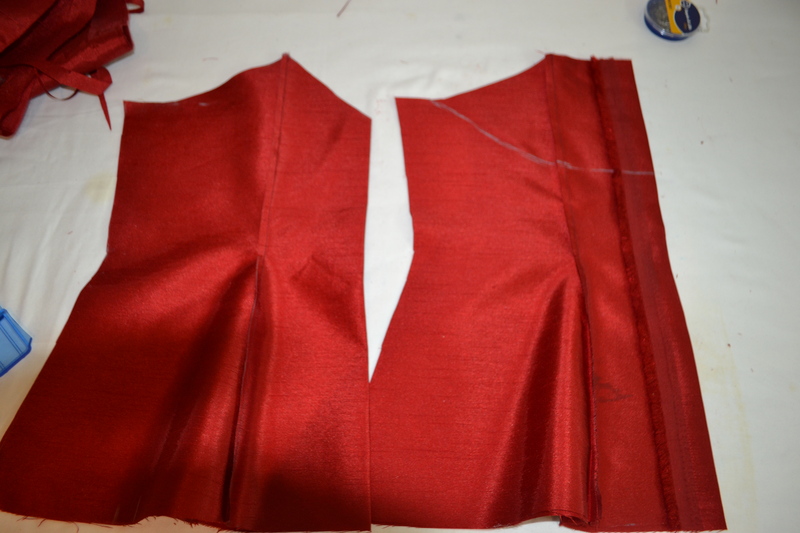 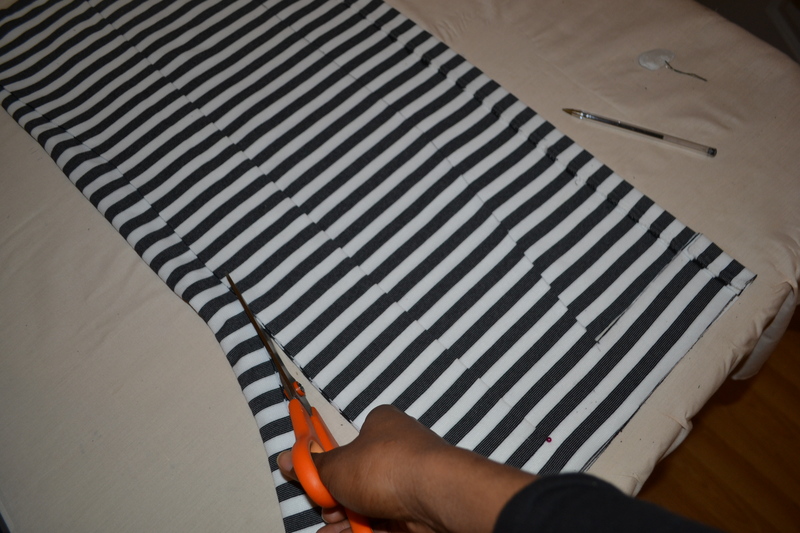 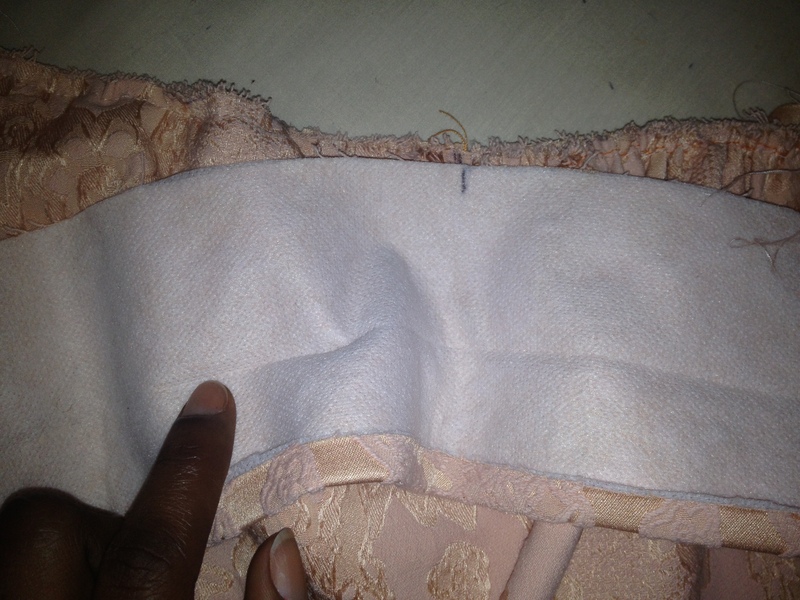 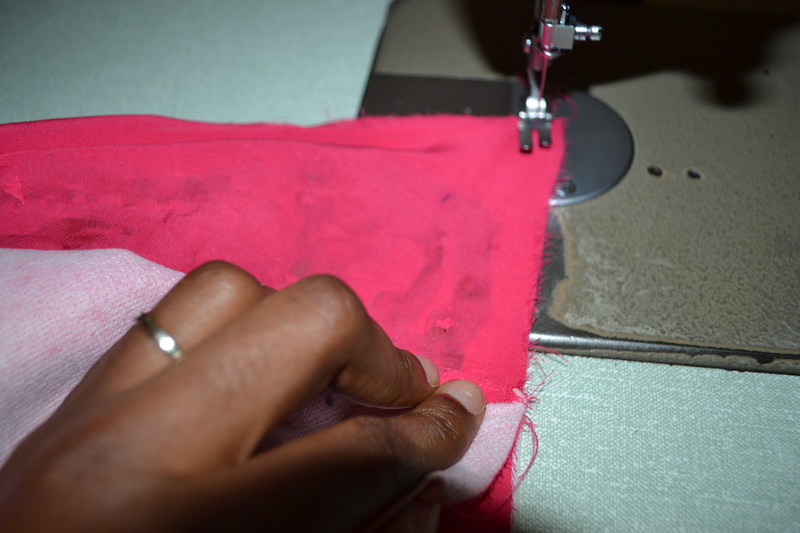 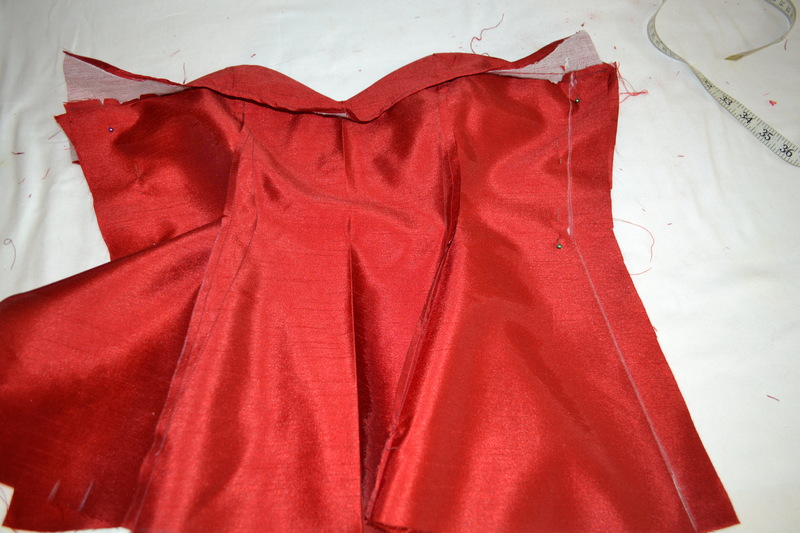 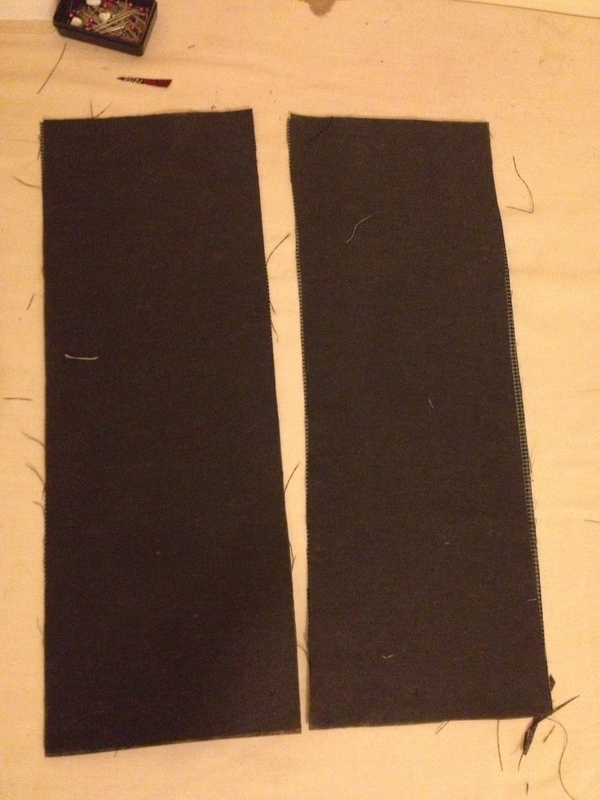 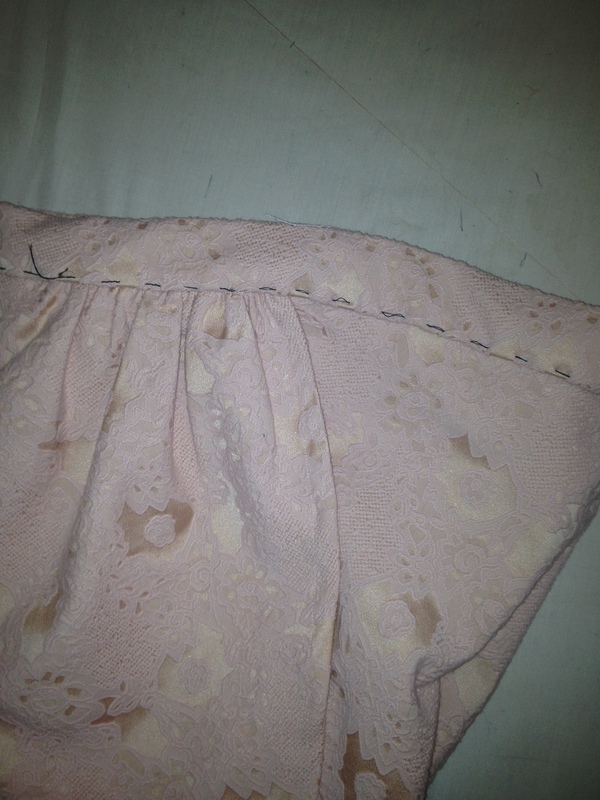 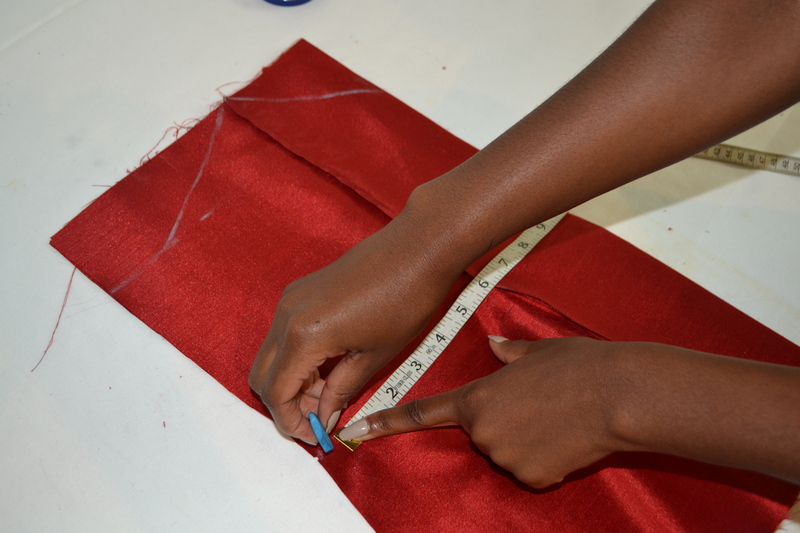 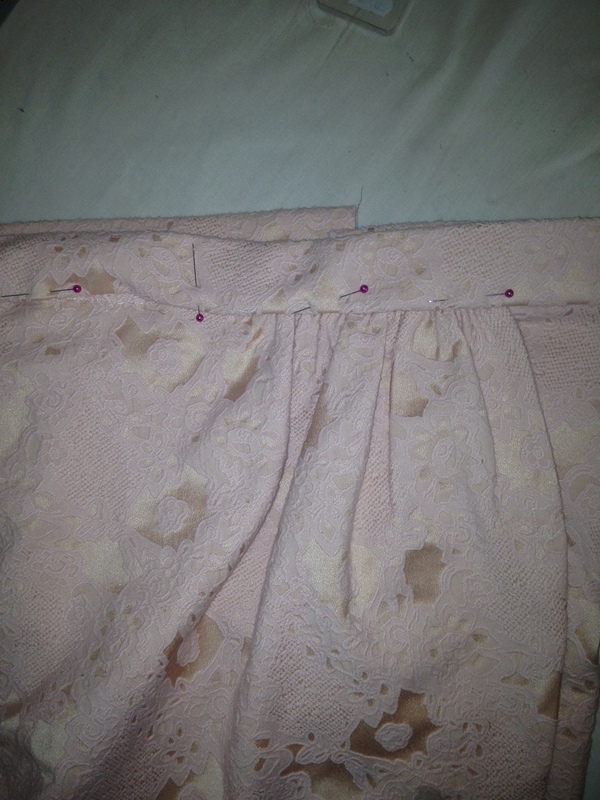 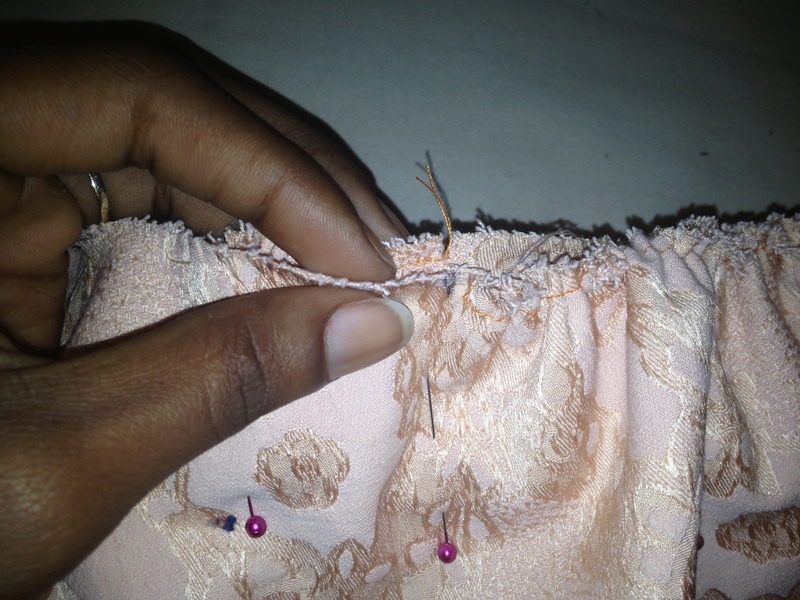 Sew along the lines you created in both side seams. 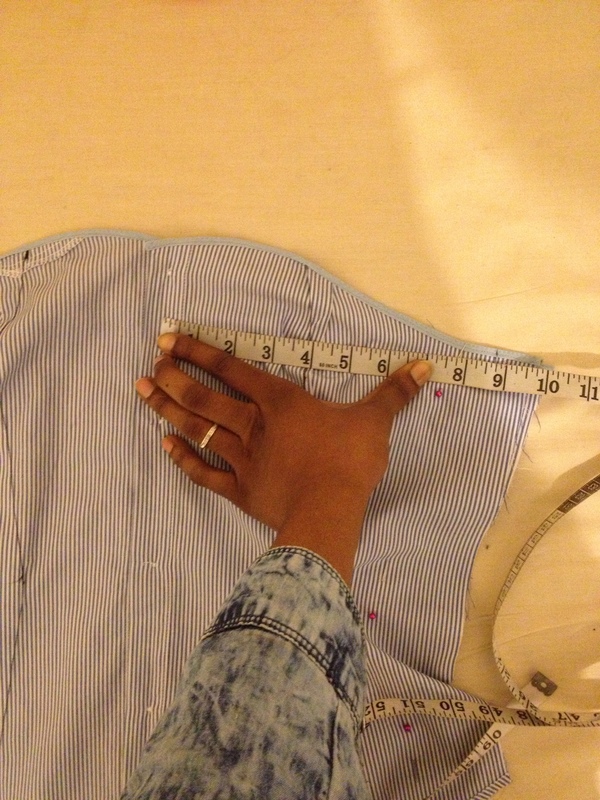 Test your top for fit and make any necessary adjustments by letting out or taking in the side seams (always equal amounts on both sides). 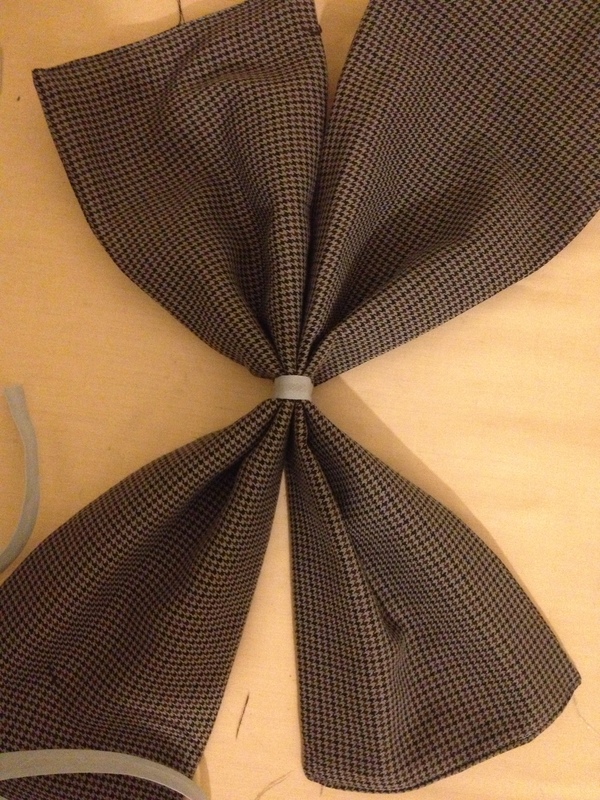 For the bow I decided to use another fabric because my husband would notice if 2 of his shirts went missing. 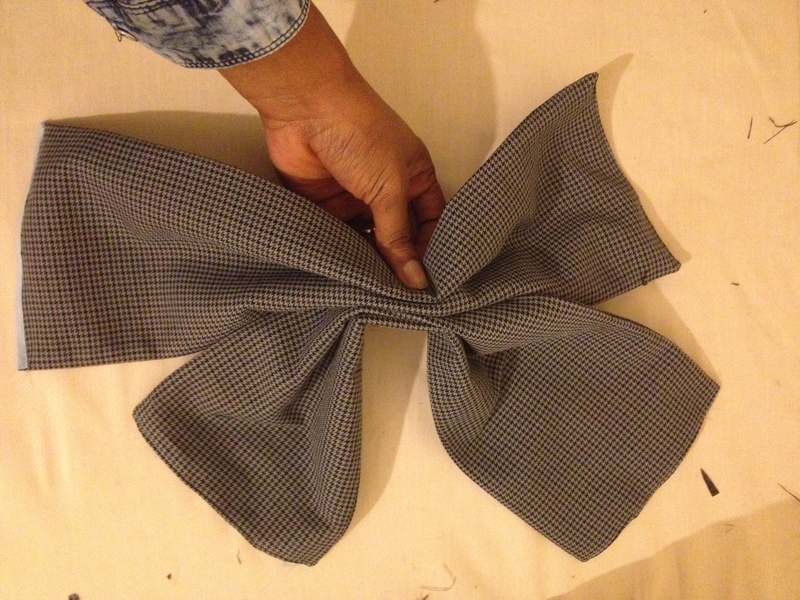 The size of the bow is completely up to you. 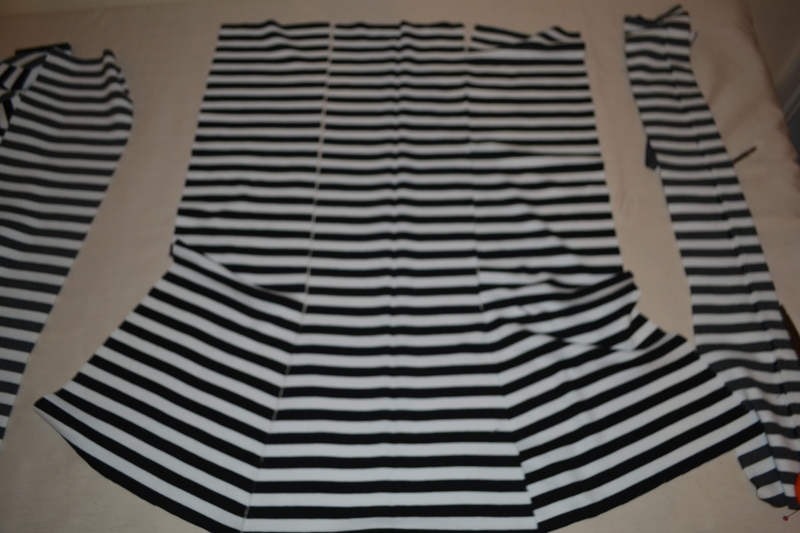 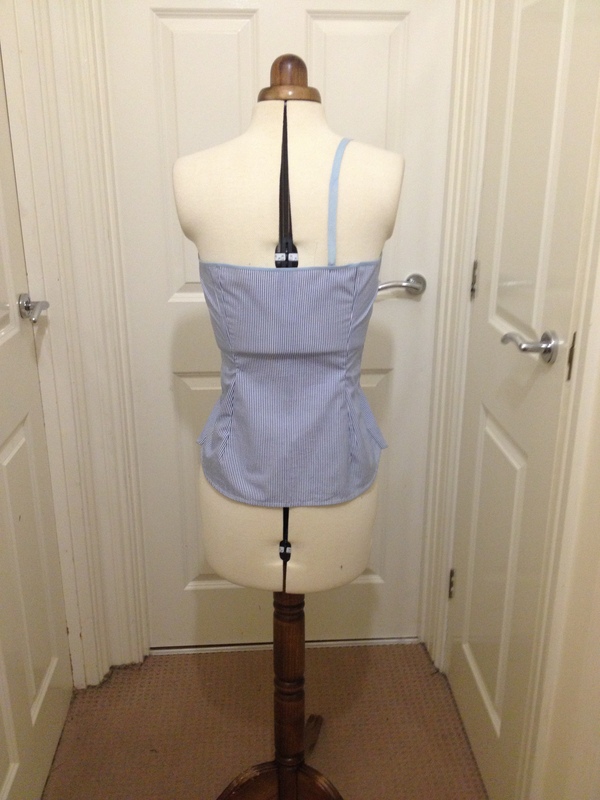 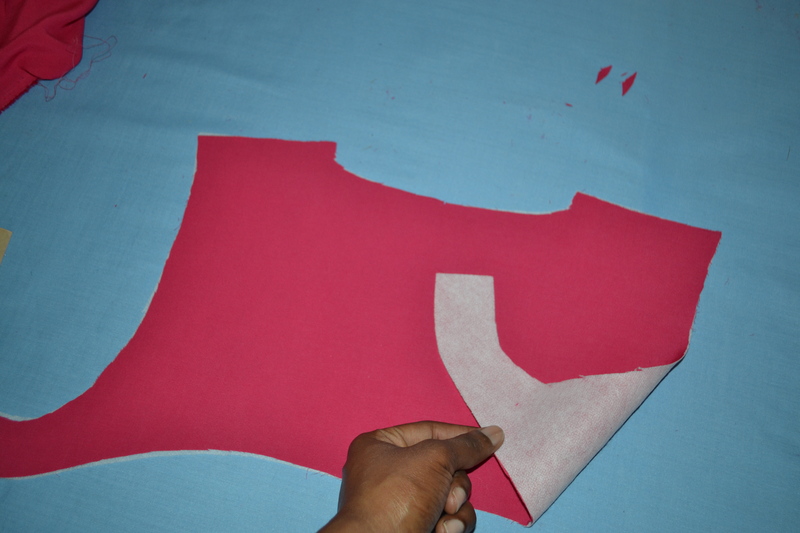 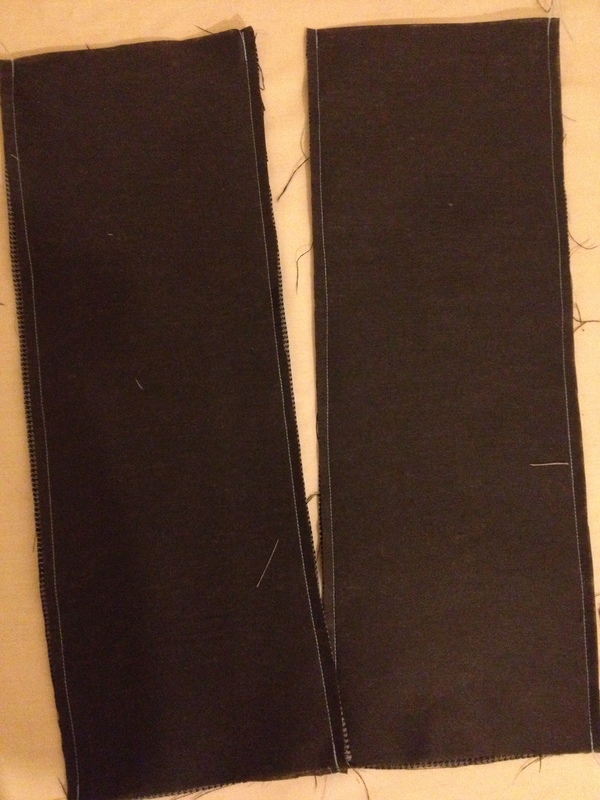 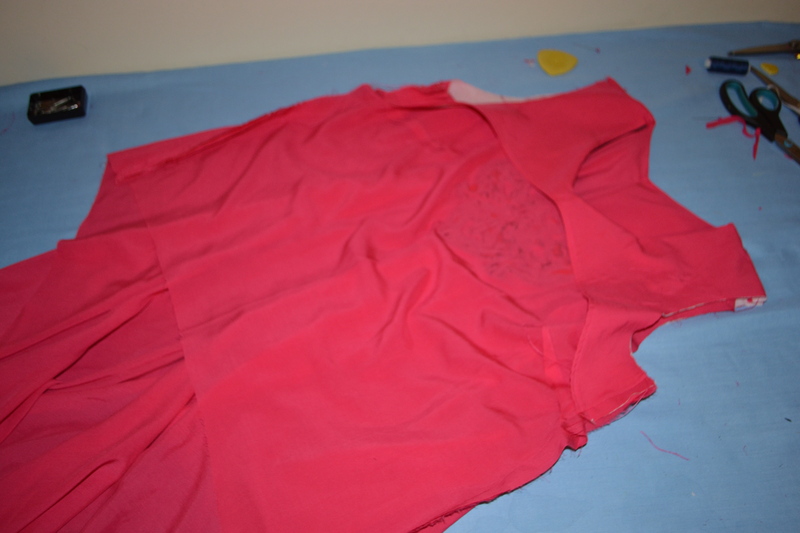 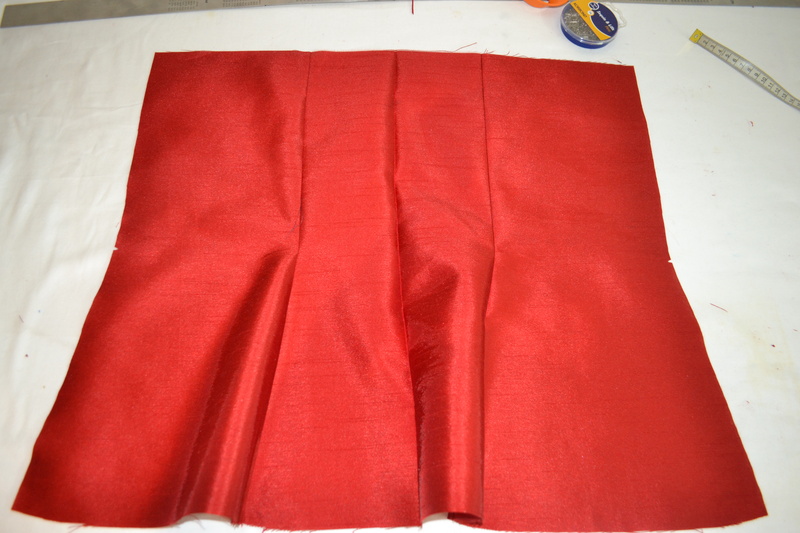 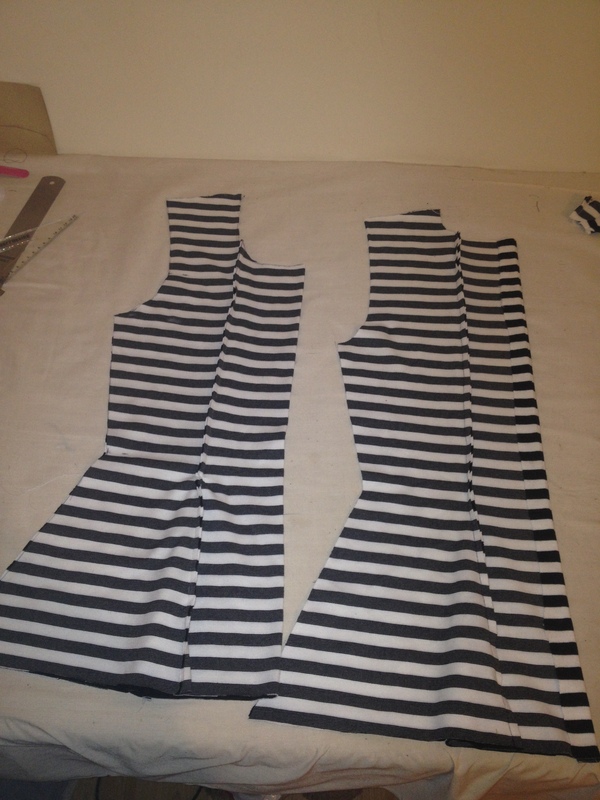 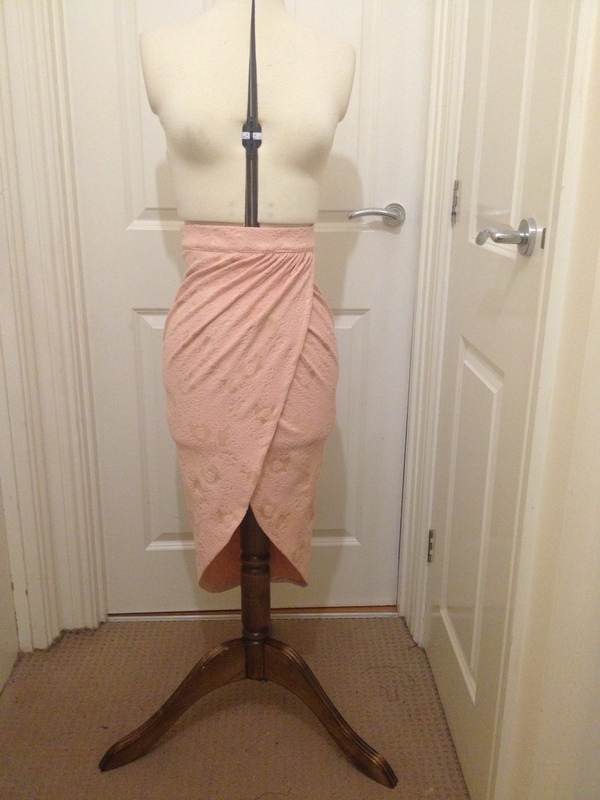 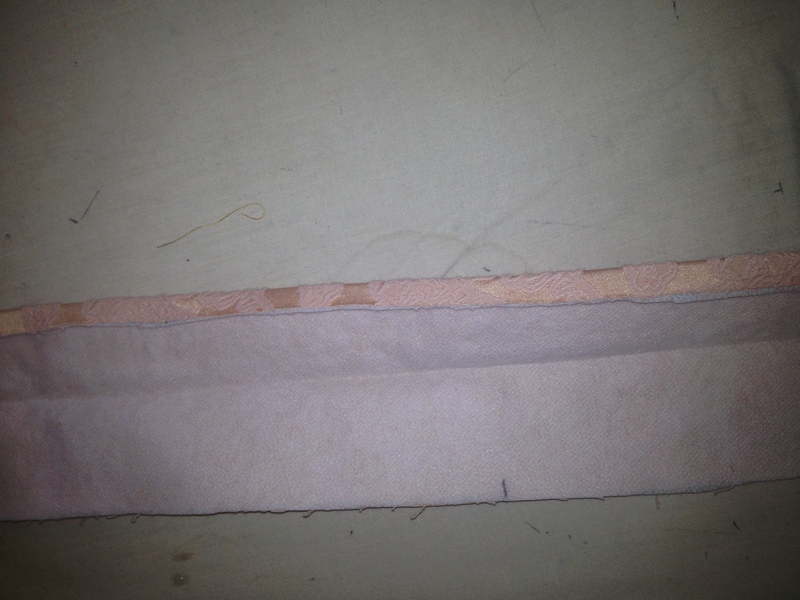 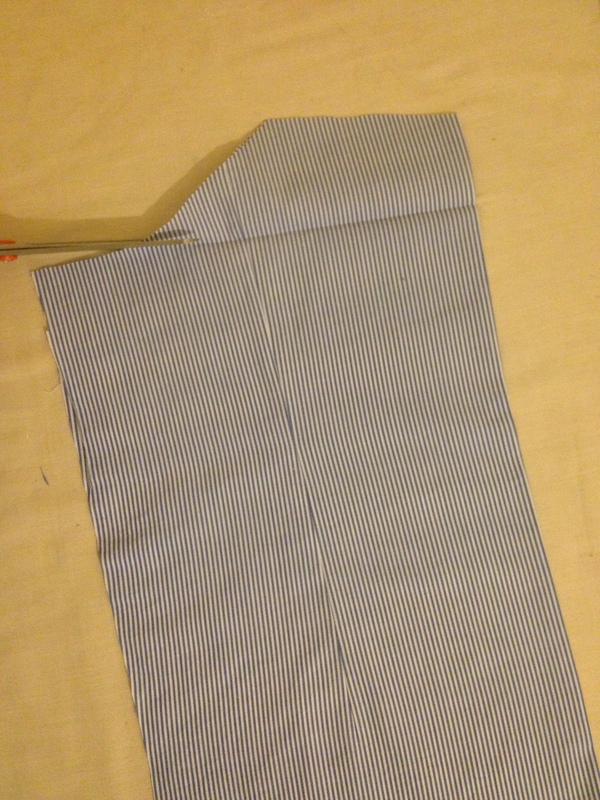 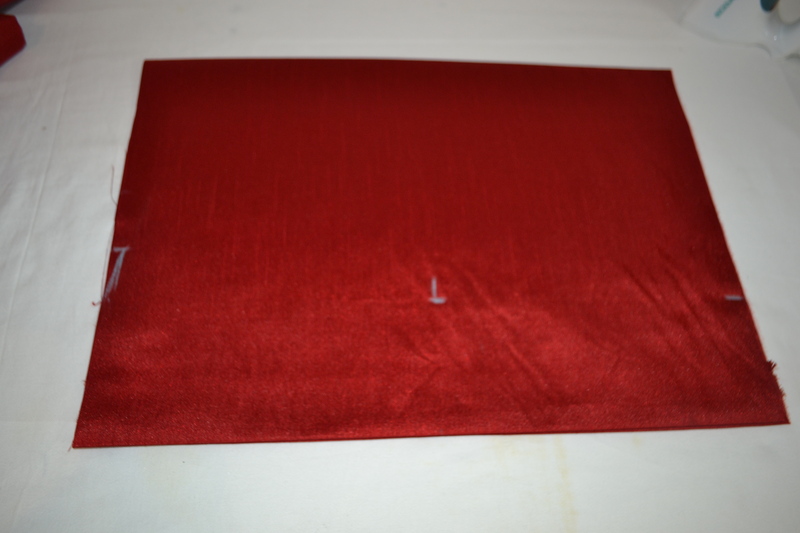 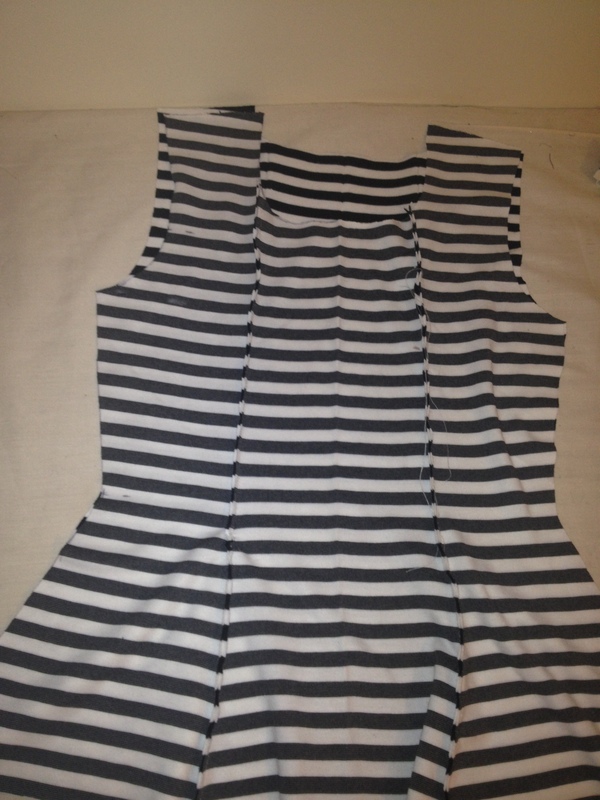 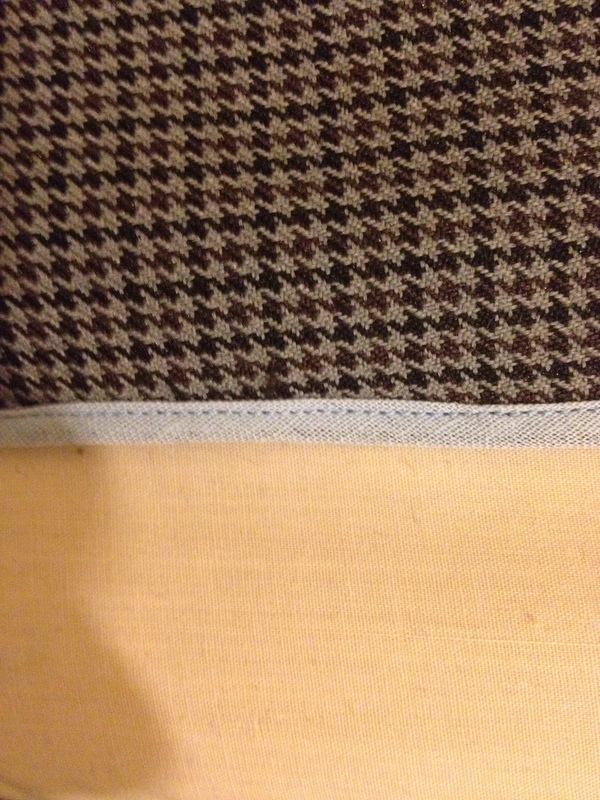 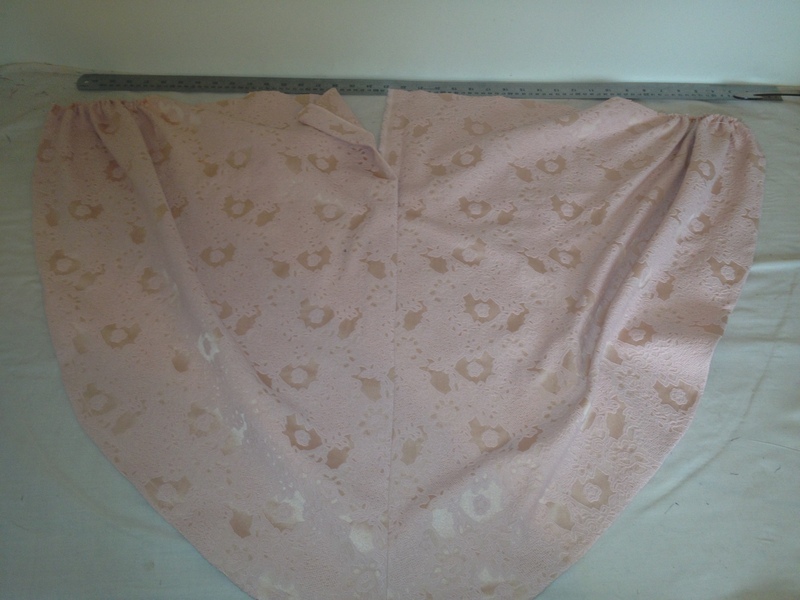 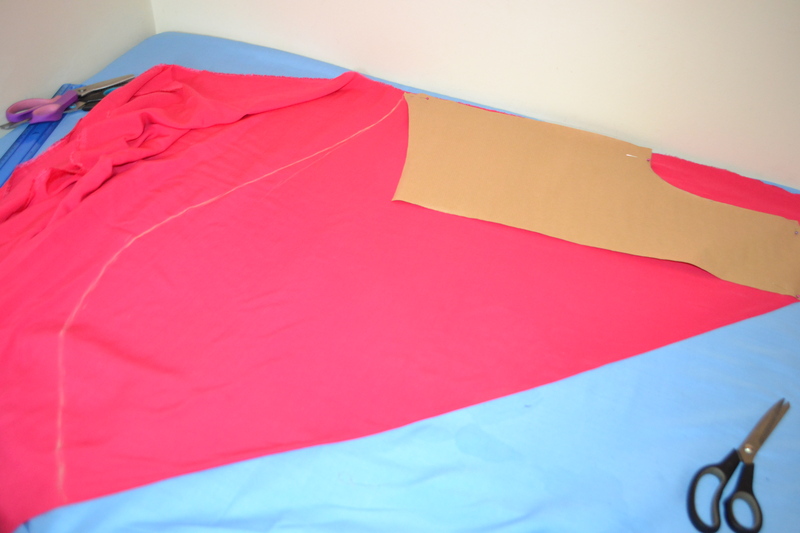 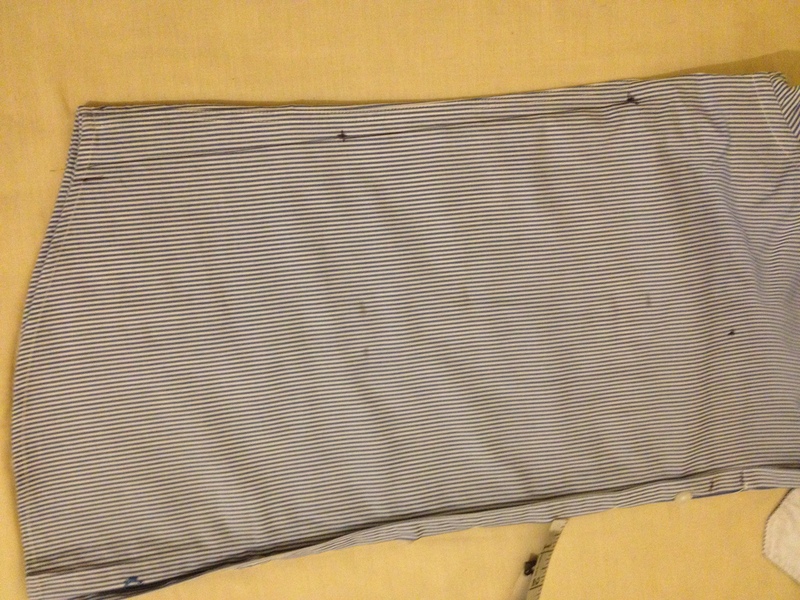 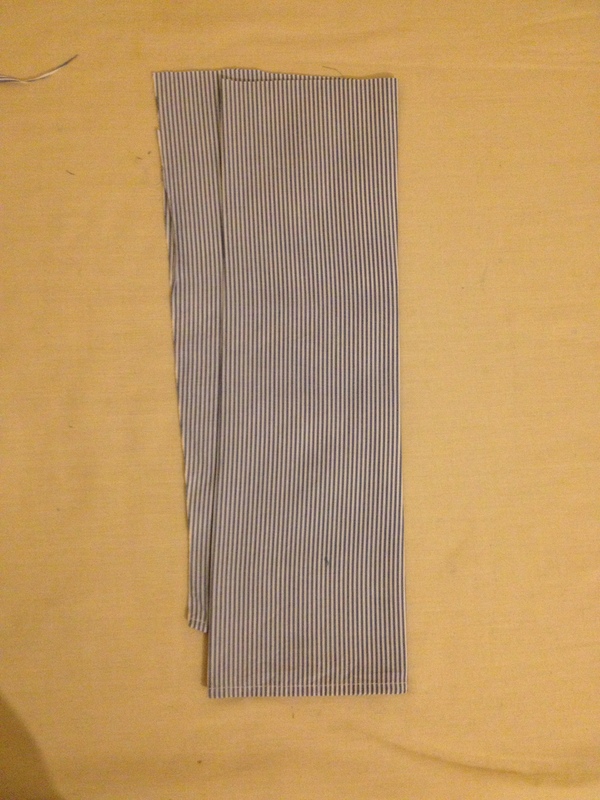 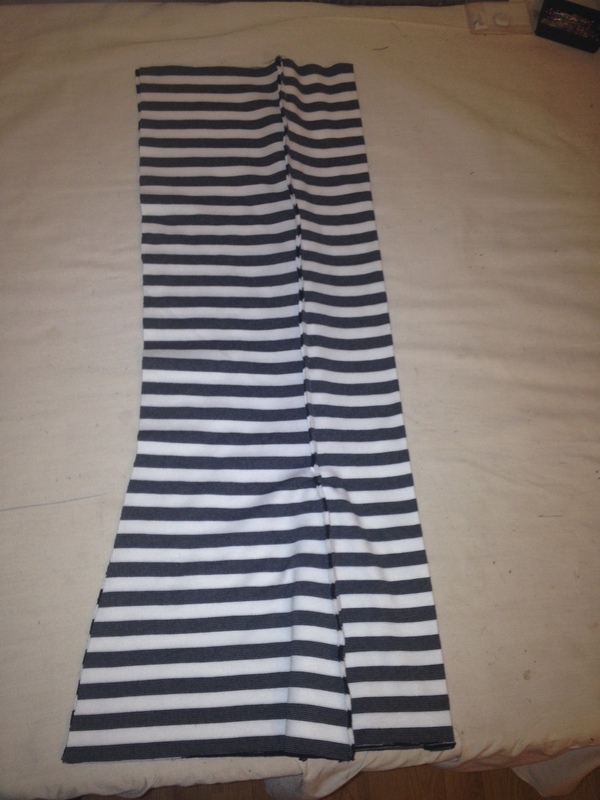 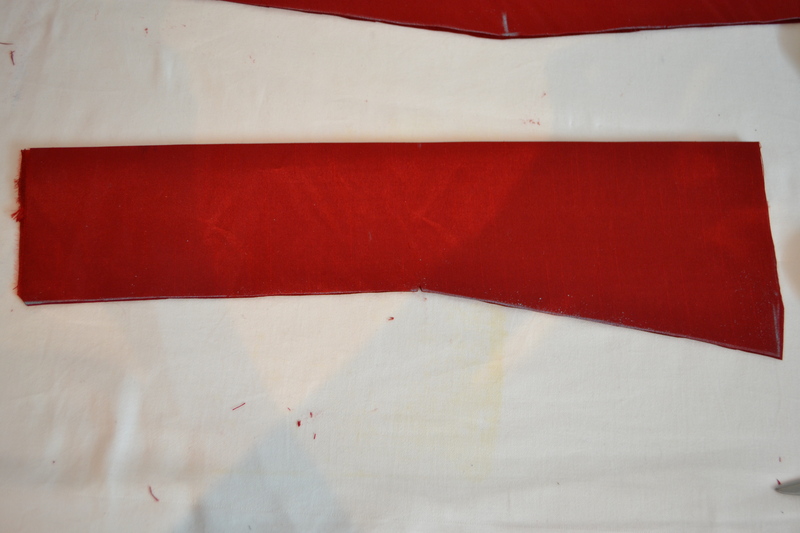 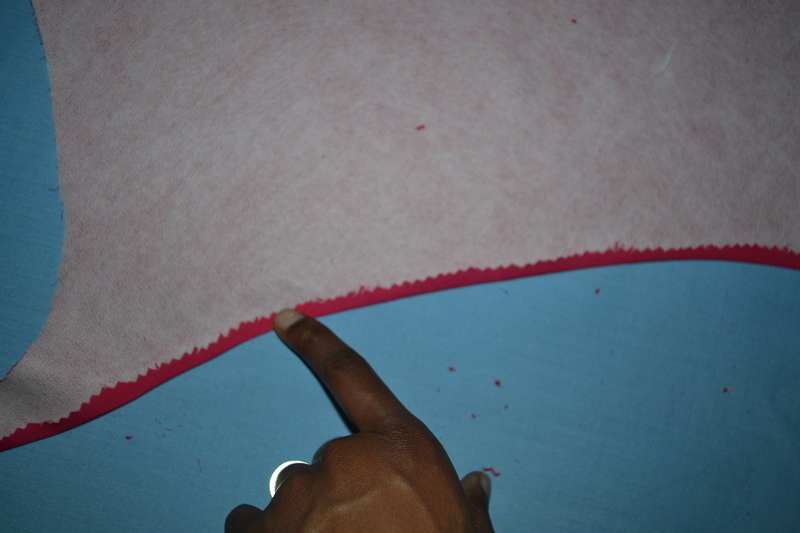 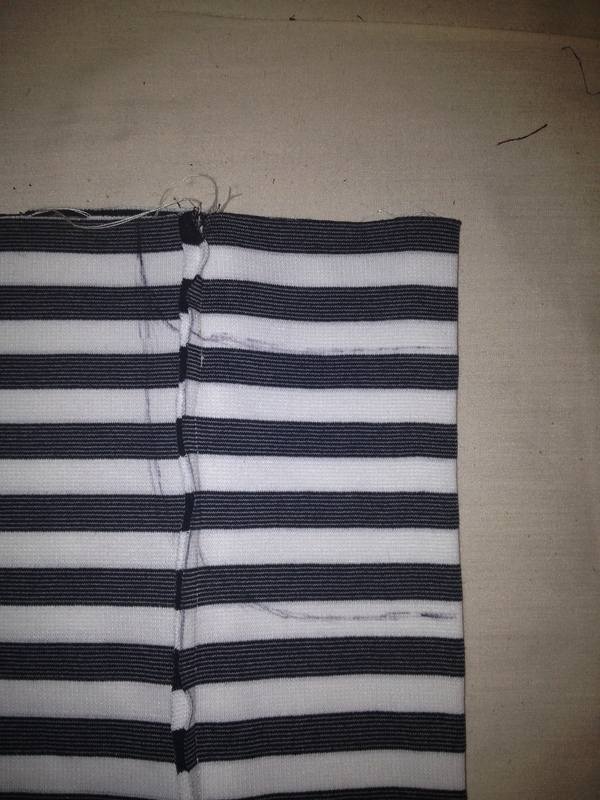 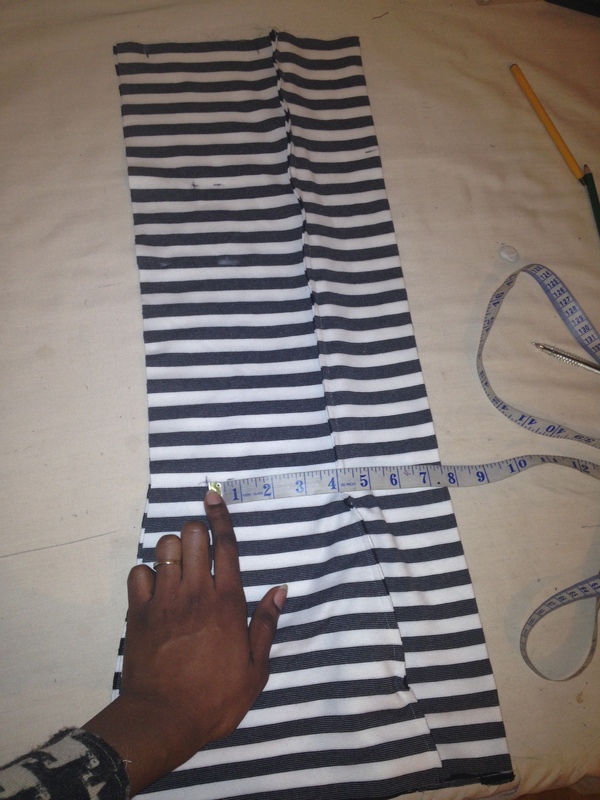 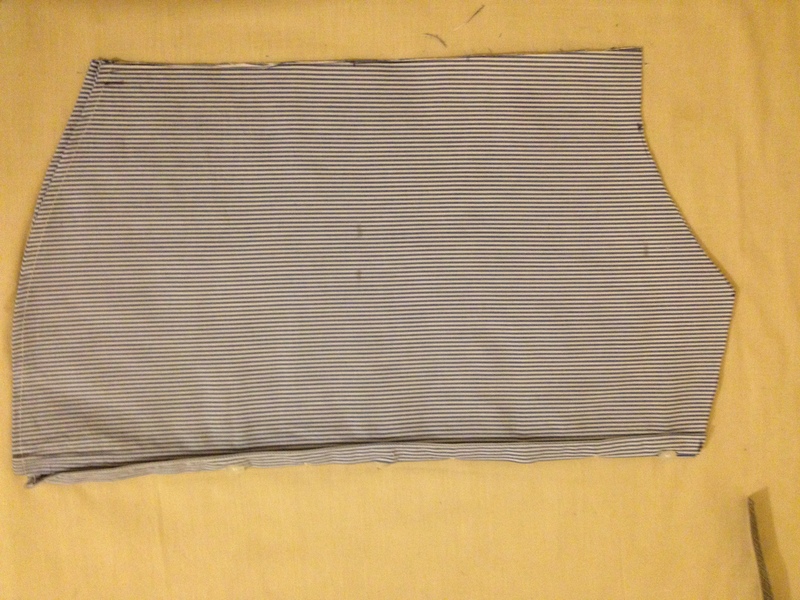 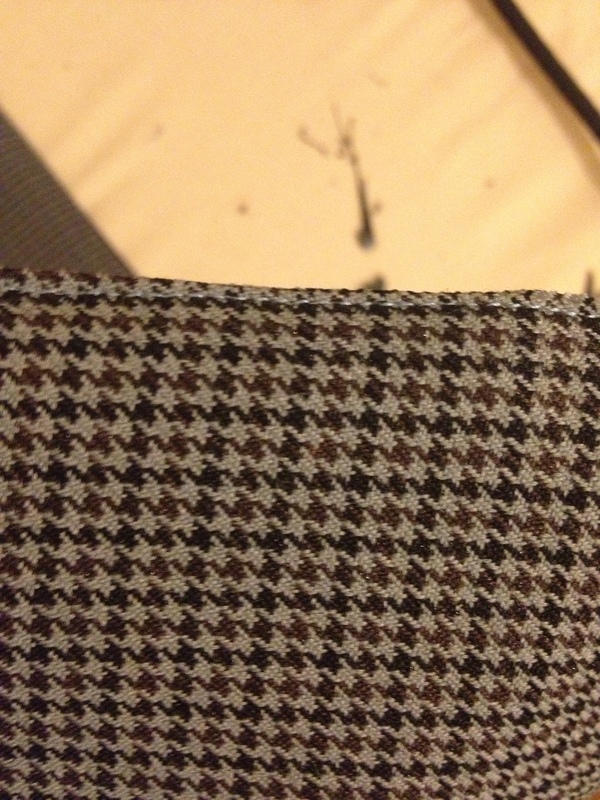 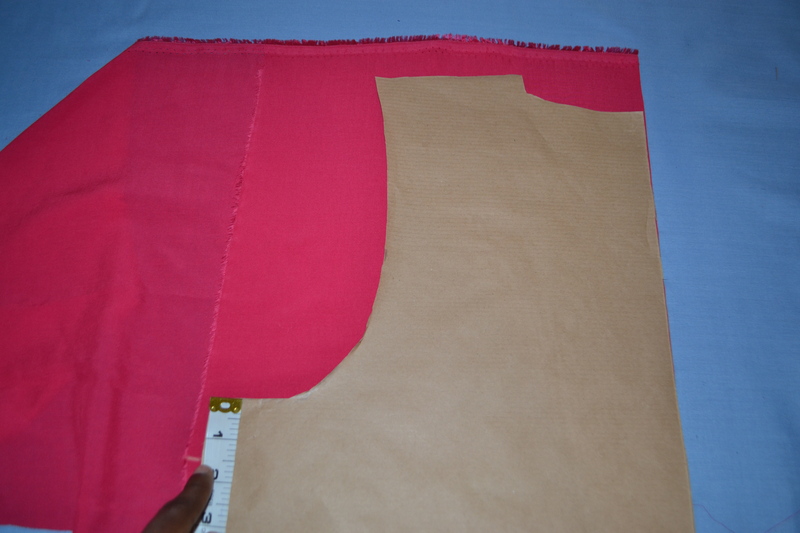 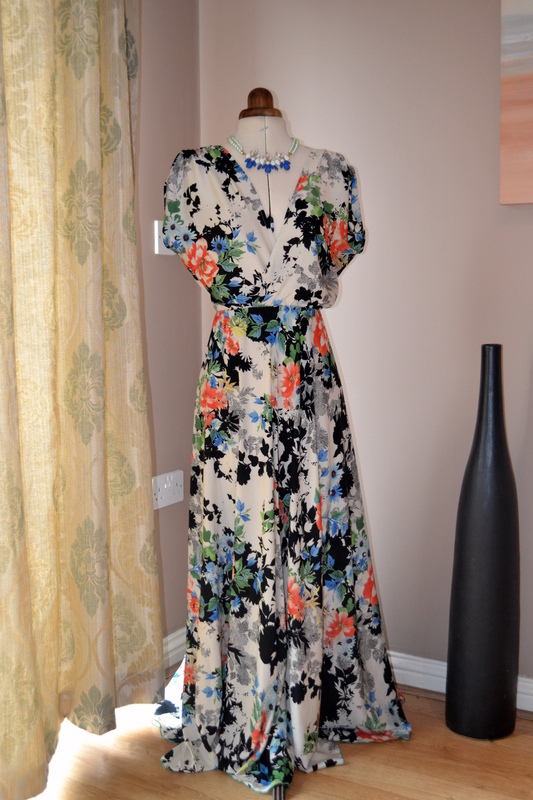 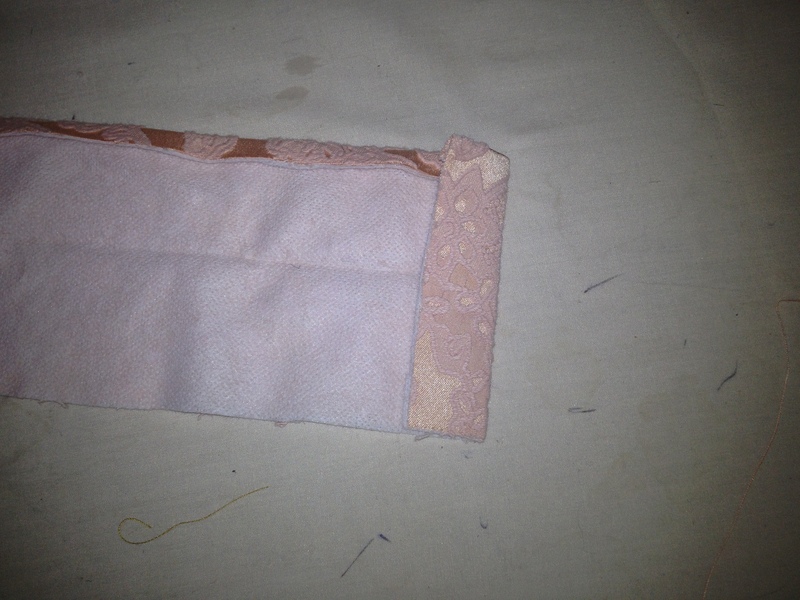 It is made using 4 identical strips of fabric and 2 strips of fuseable interfacing. 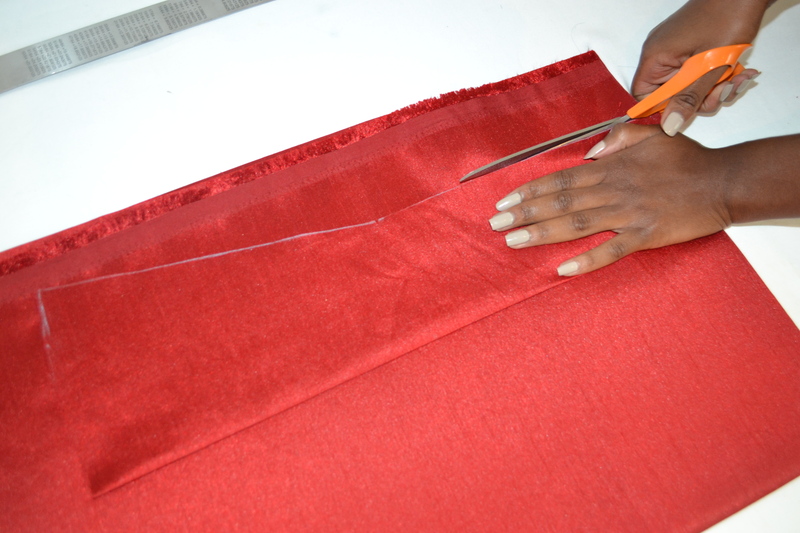 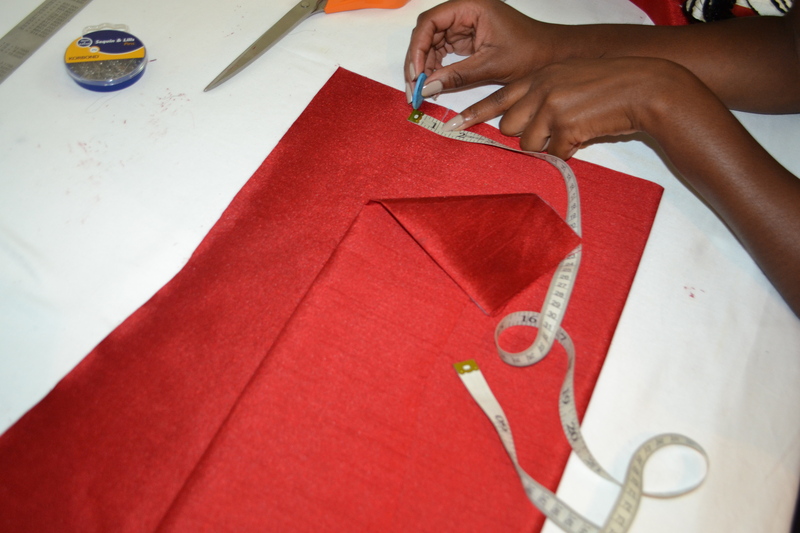 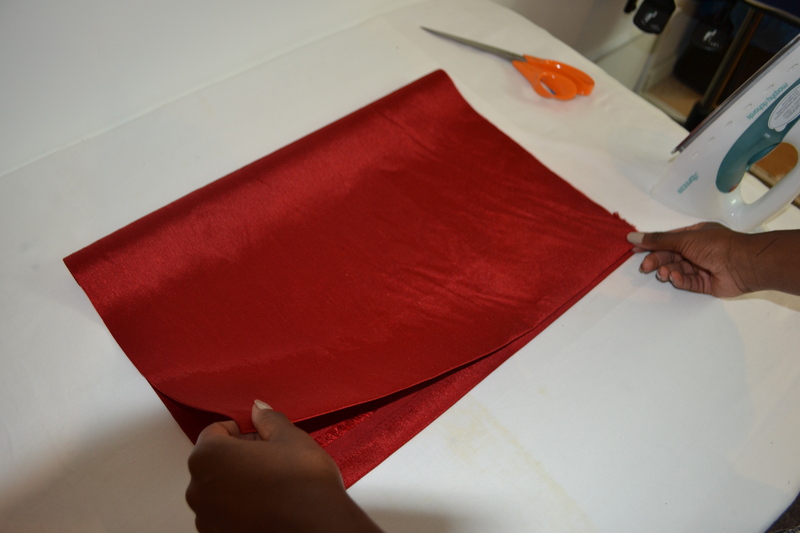 Drape the bow on the ribbon over the shoulder and secure with a few discrete hand stitches, so that it holds the shape you want it to. 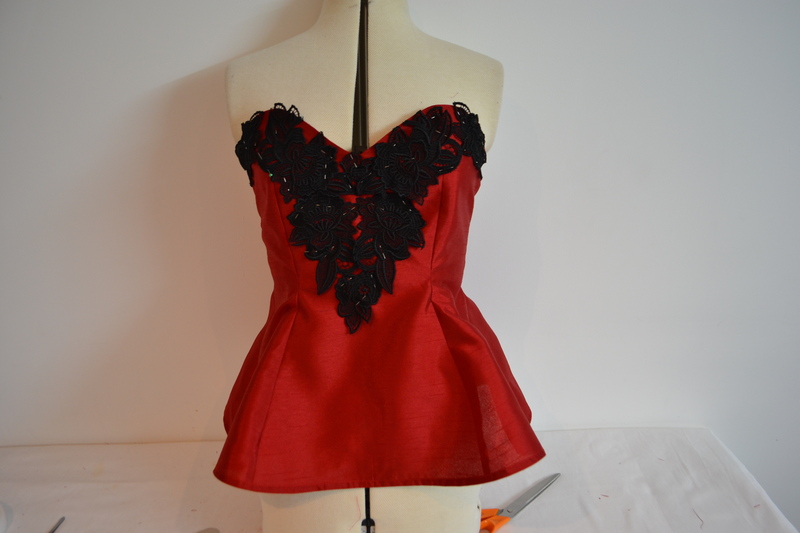 Have fun creating your own, oooh and try some contrasting fabrics and trimmings (for the Tamaras out there). 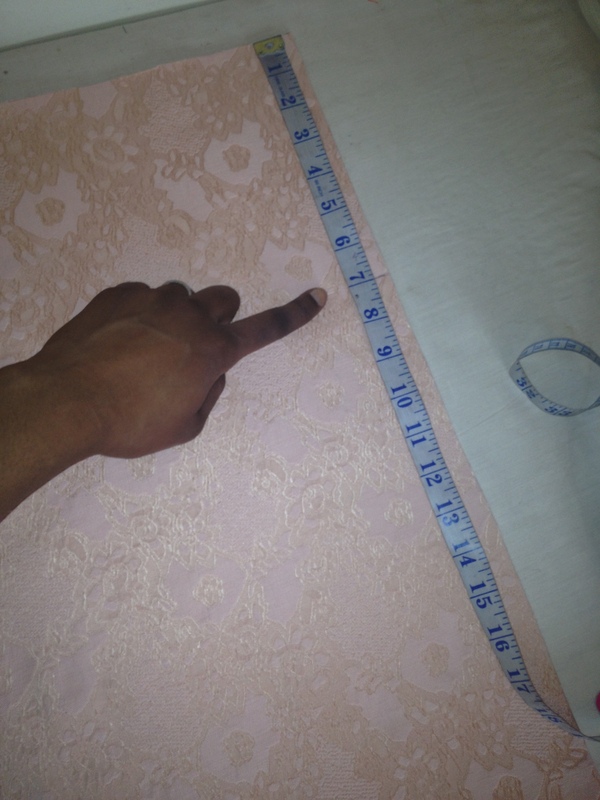 Please send me pictures of your own project and place your comments in the form below.